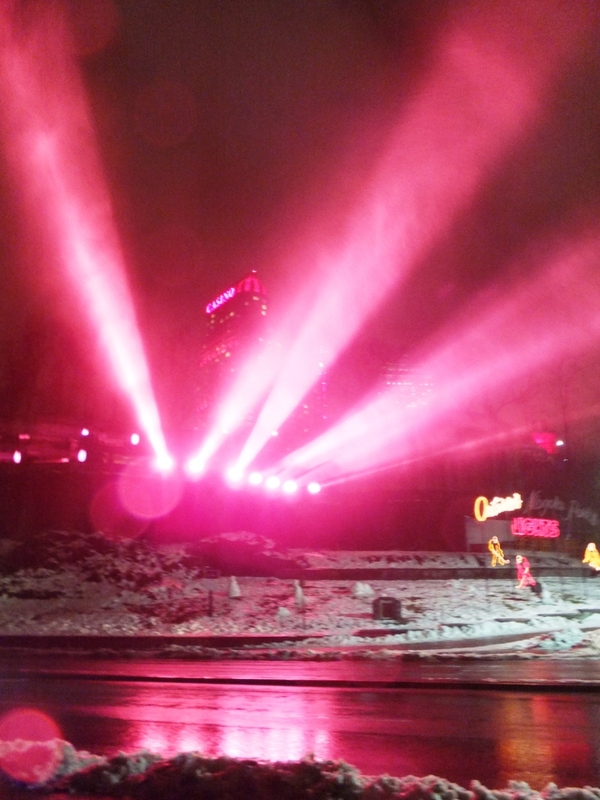 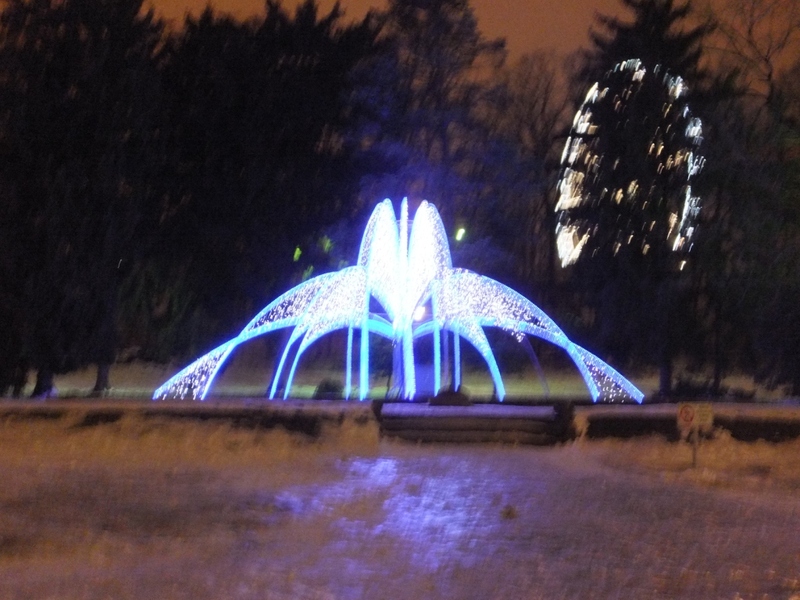 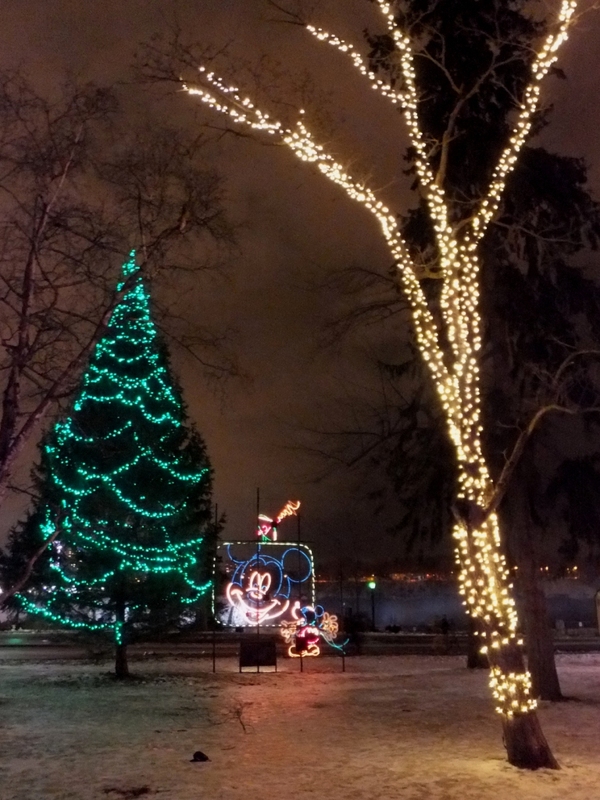 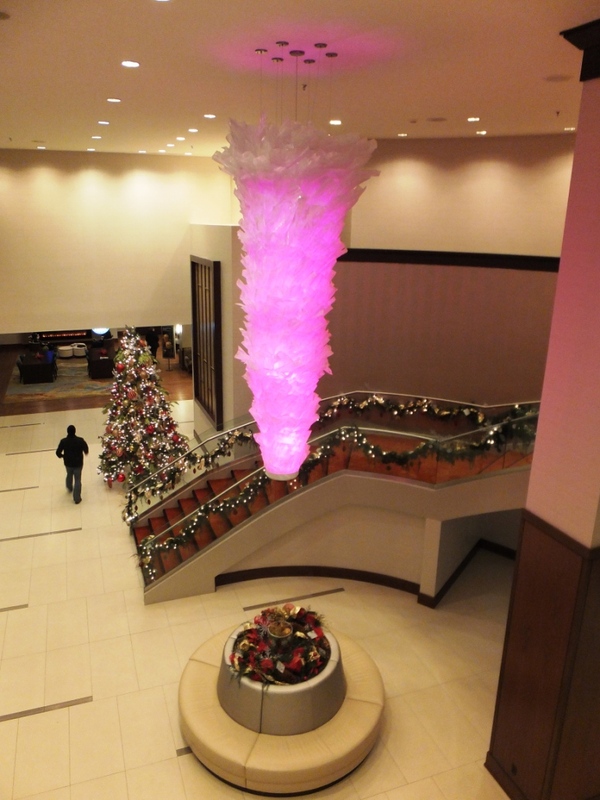 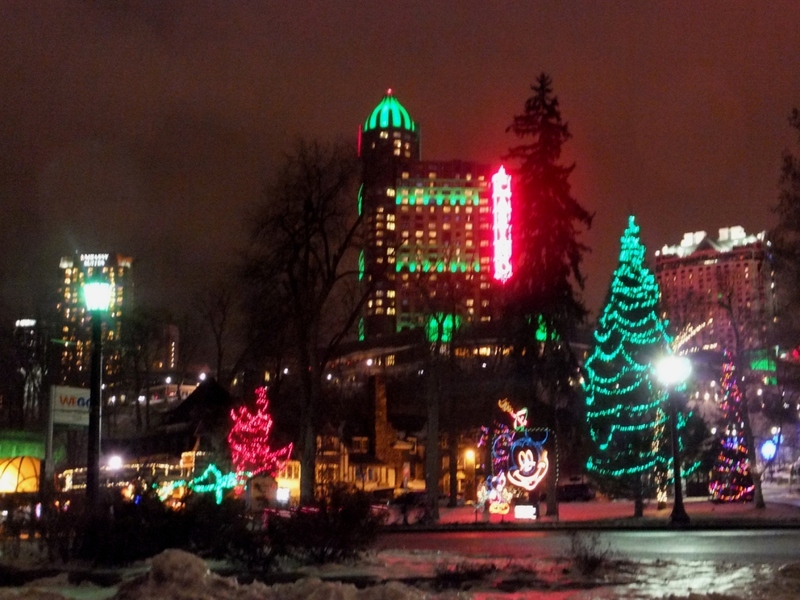 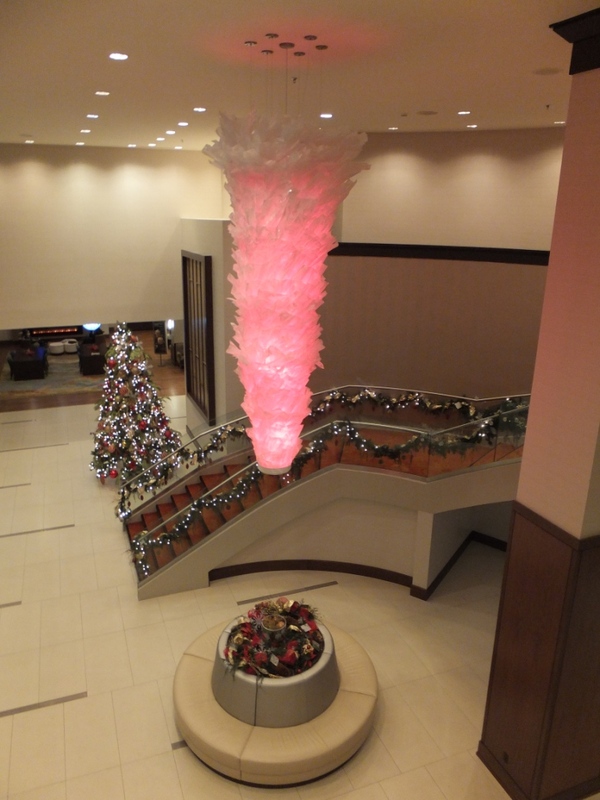 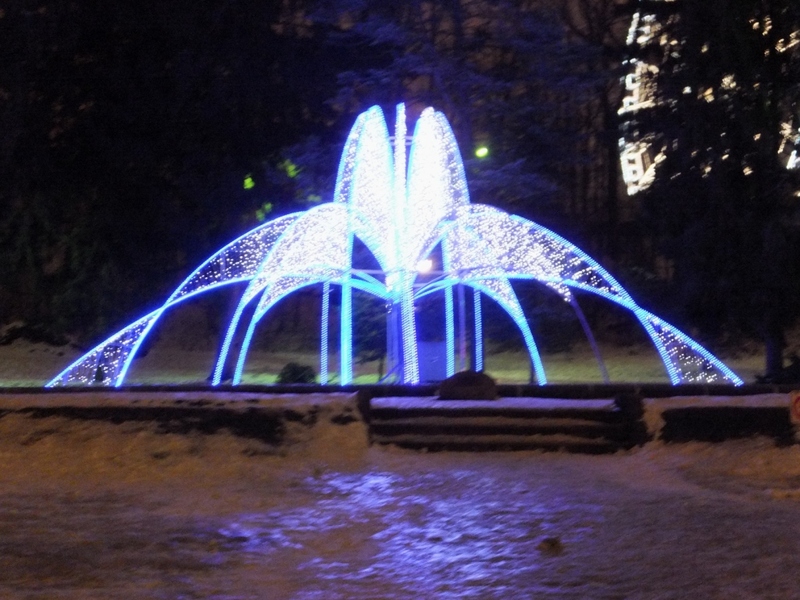 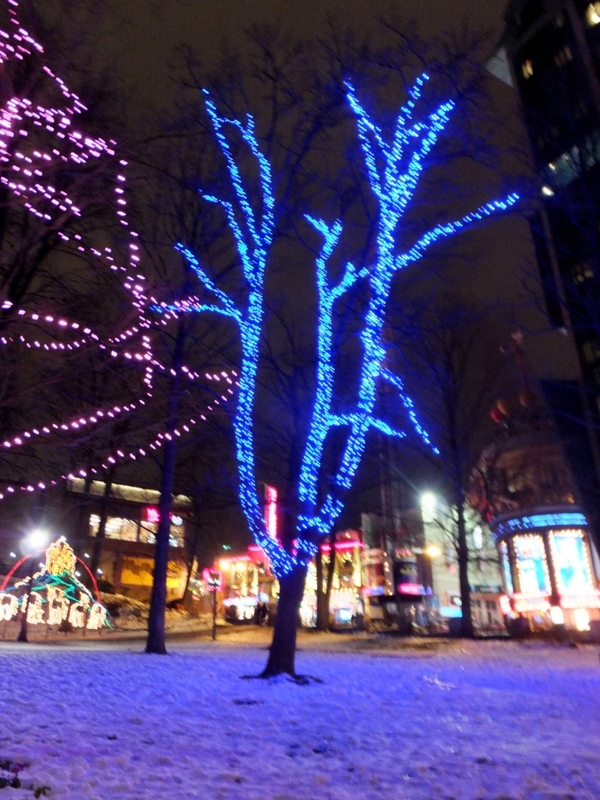 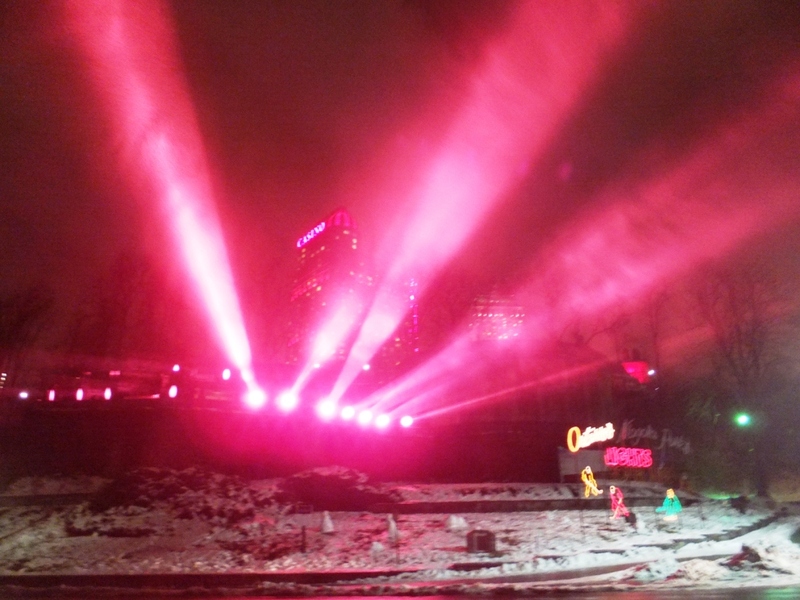 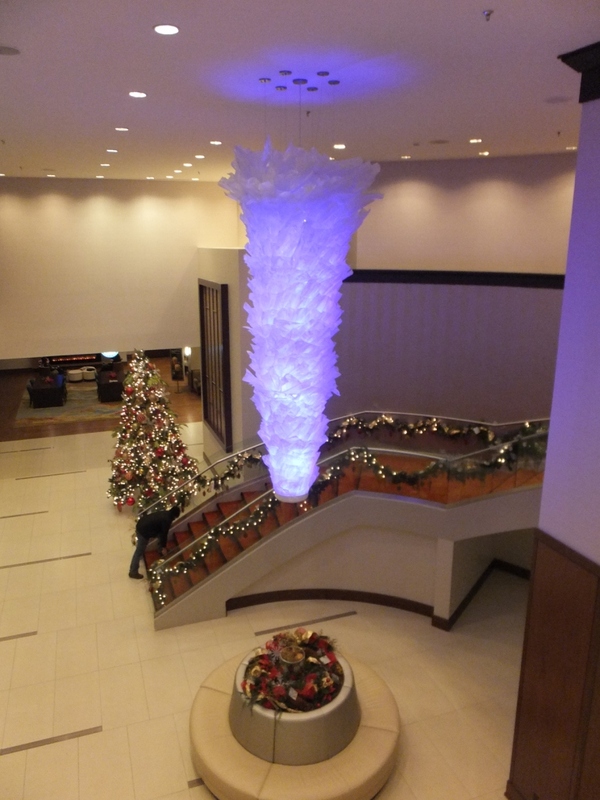 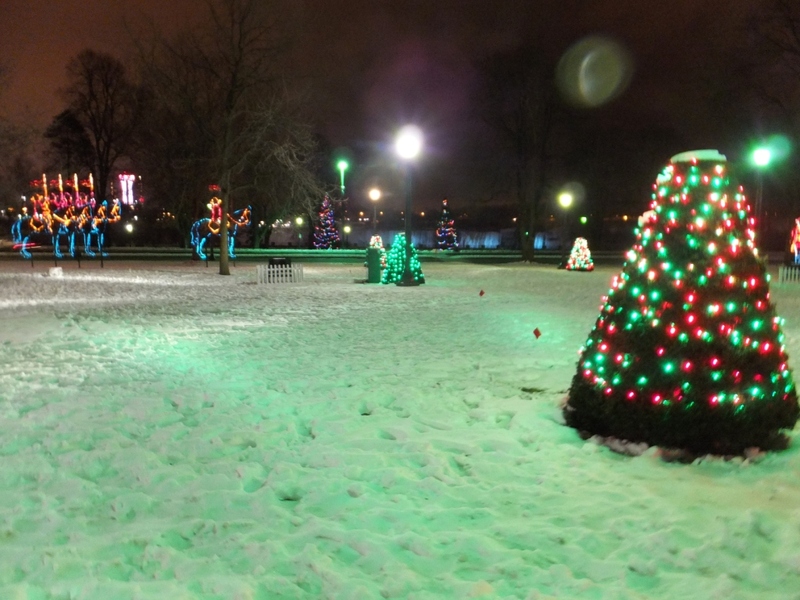 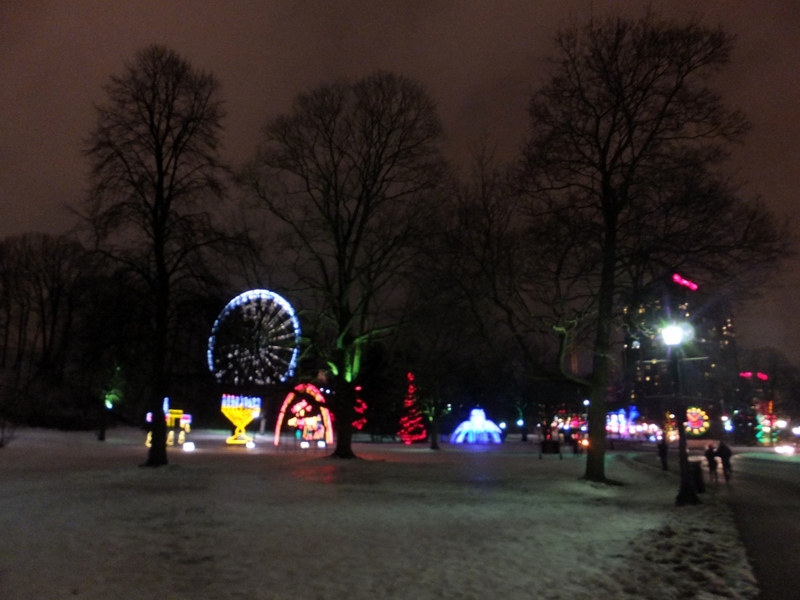 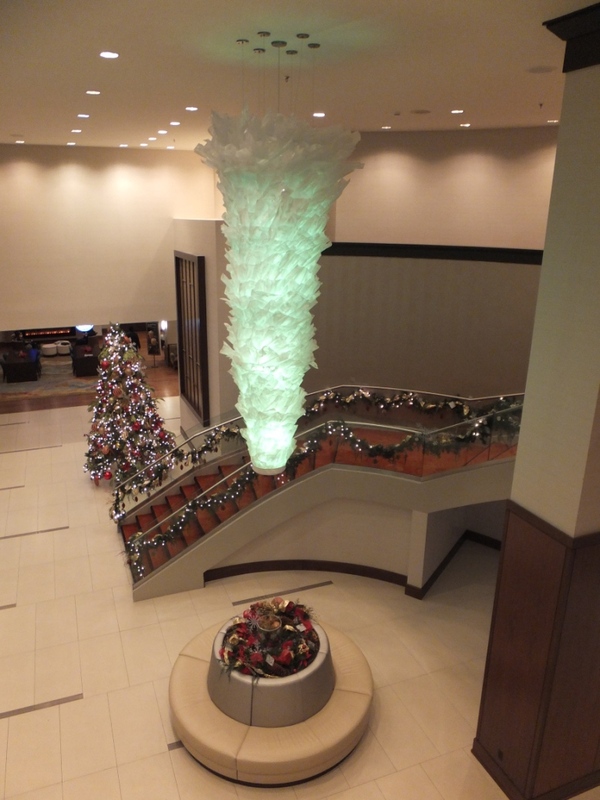 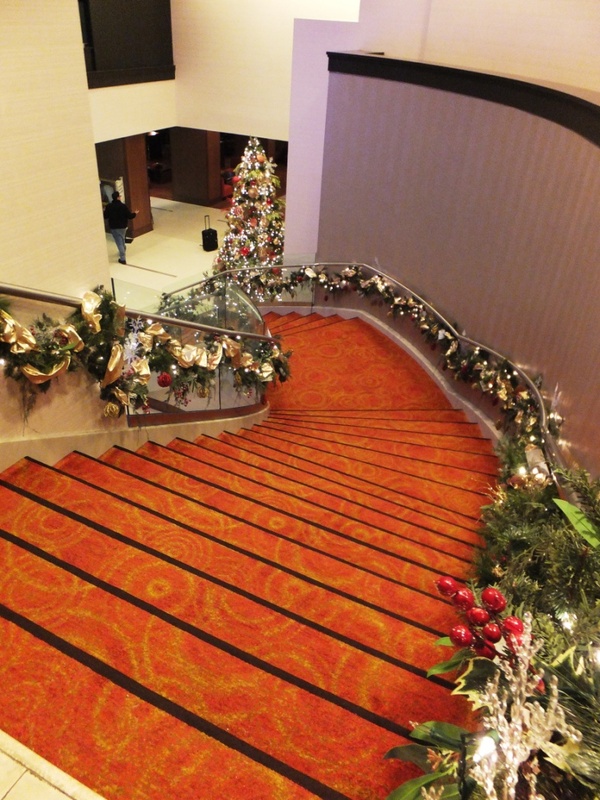 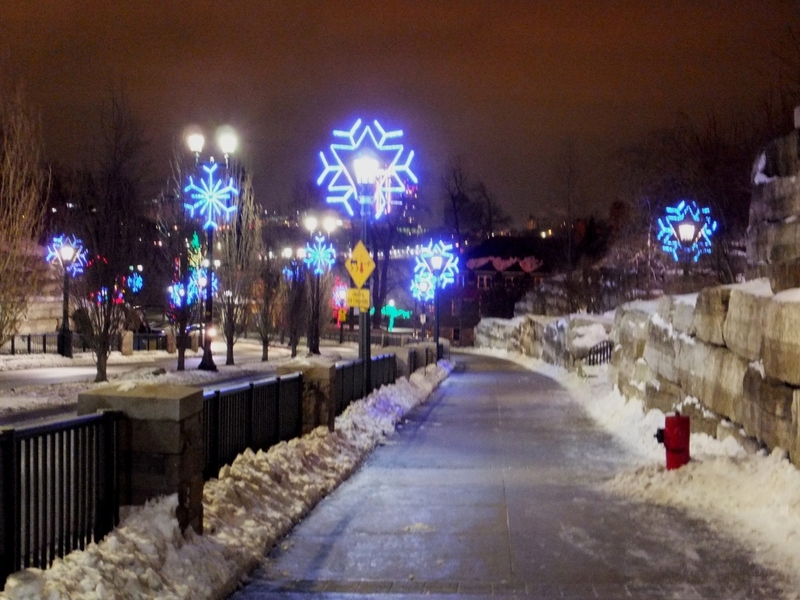 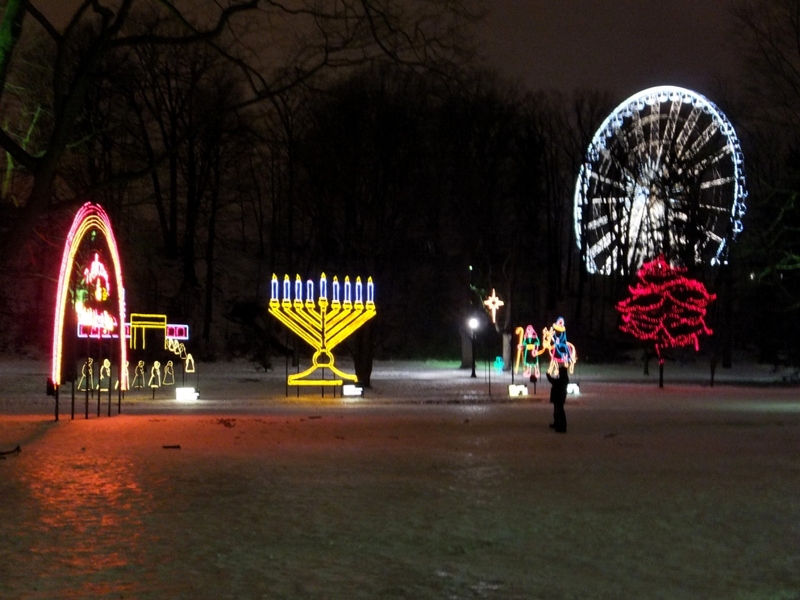 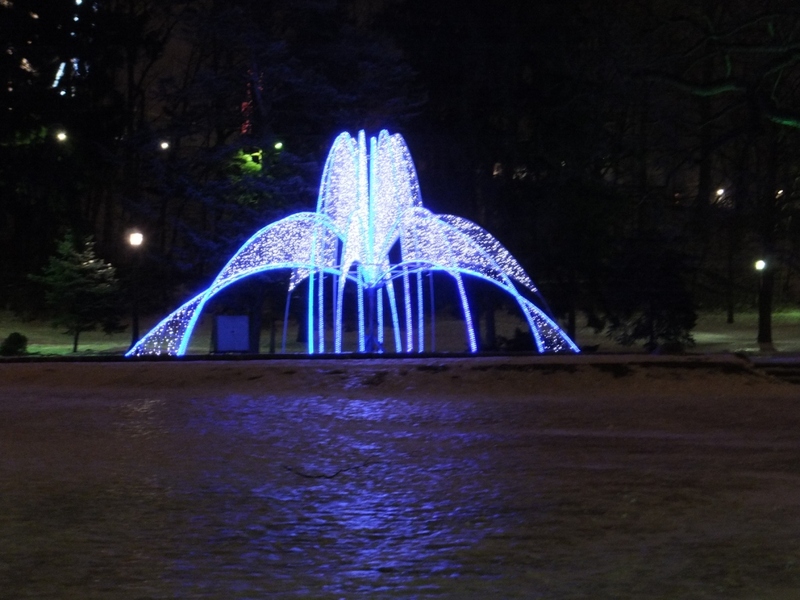 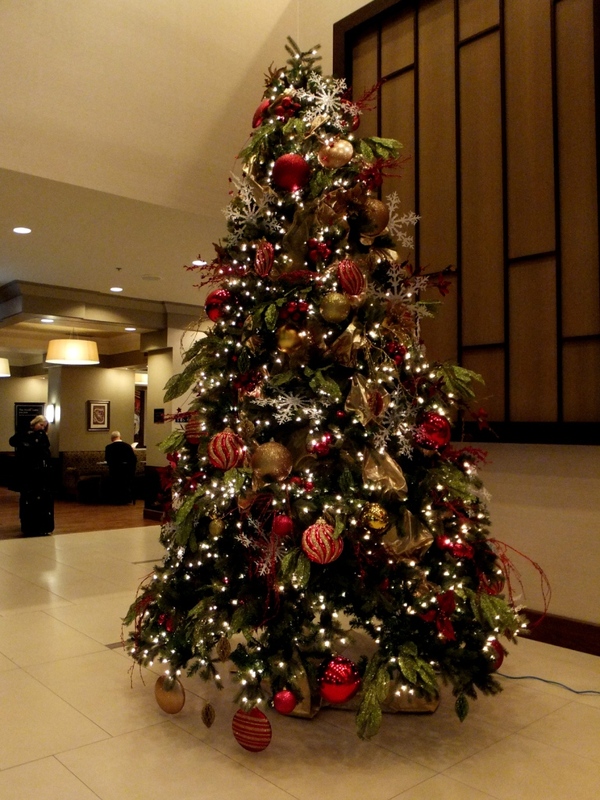 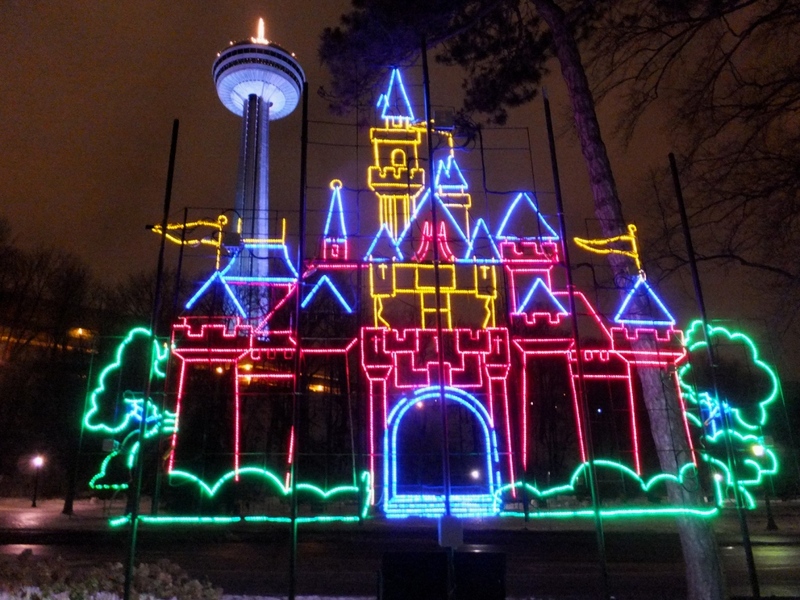 Niagara Falls, Ontario is a great getaway destination, even in the winter, from November to January when the CAA Winter Festival of Lights is on. 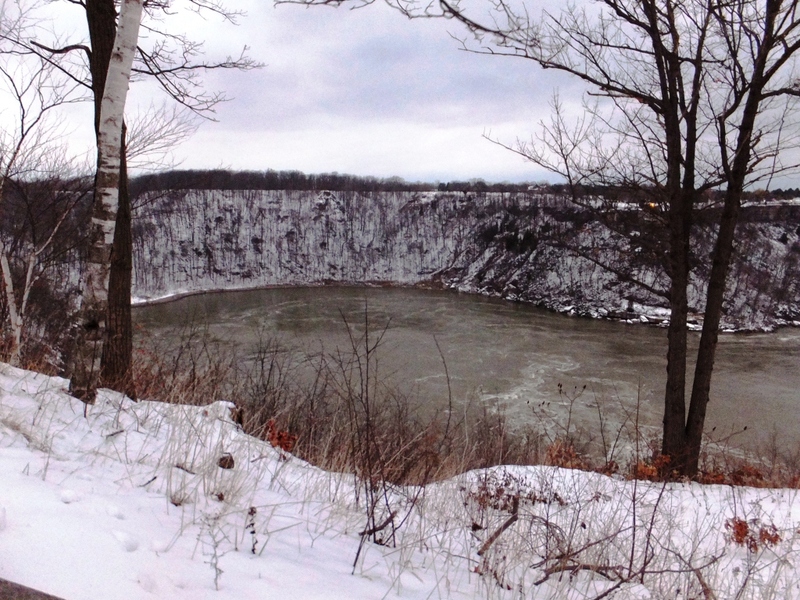 On January 4, 2013, we had spent a nice afternoon in Niagara-on-the-Lake where the Niagara River flows into Lake Ontario. 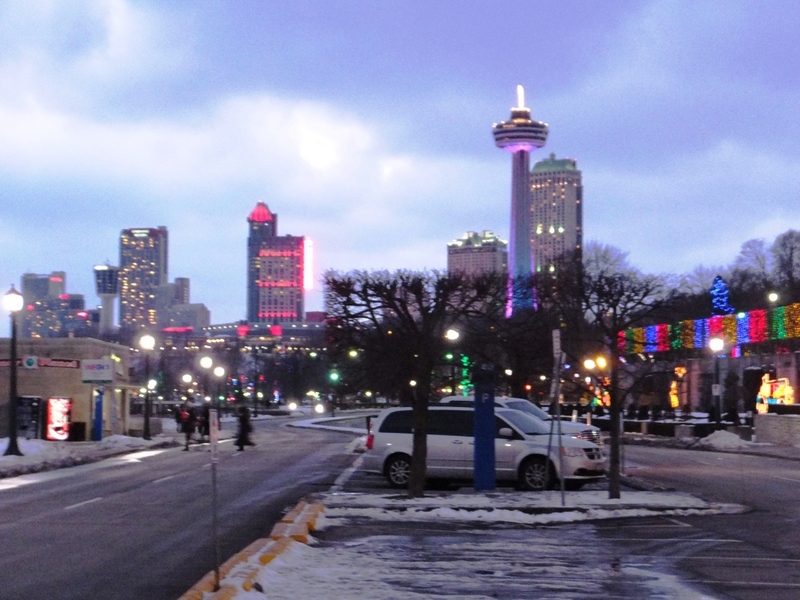 We took a nice walk along Queen Street in Niagara-on-the-Lake and also explored the historic Prince of Wales Hotel. 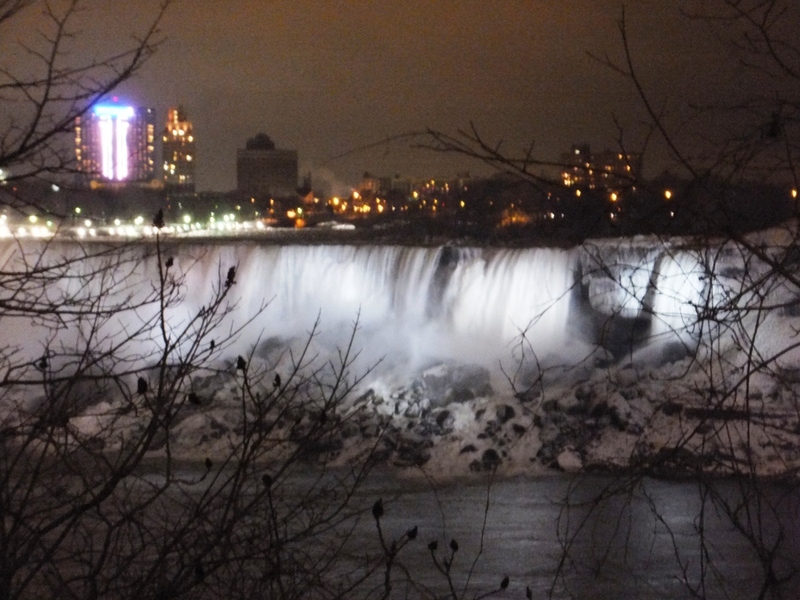 Then we enjoyed a scenic southward drive on the Niagara Parkway and made a stop at the Whirlpool, a large rounded and turbulent inlet along the Niagara River that formed at the intersection with an ancient river bed that was buried by glacial silt and rocks. 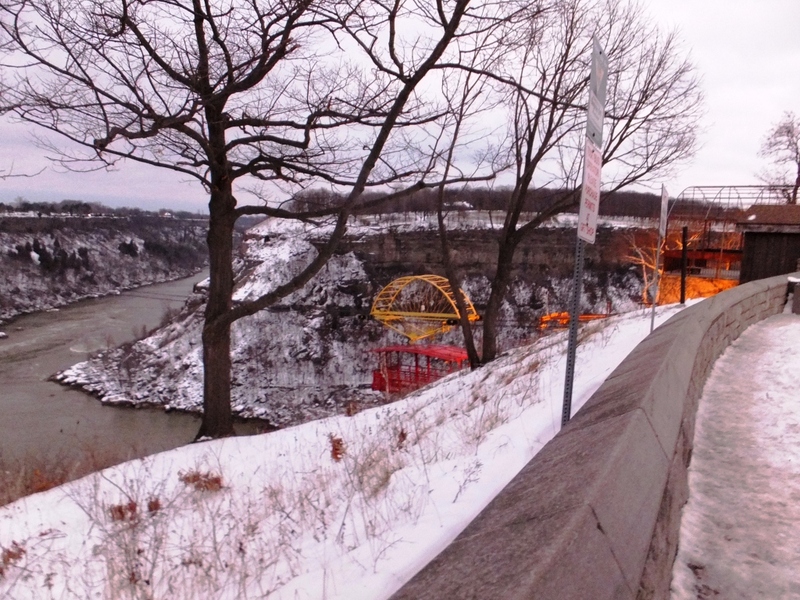 The Whirlpool Areo Car, a cable car that was built in 1916, crosses the entire span of the Whirlpool. 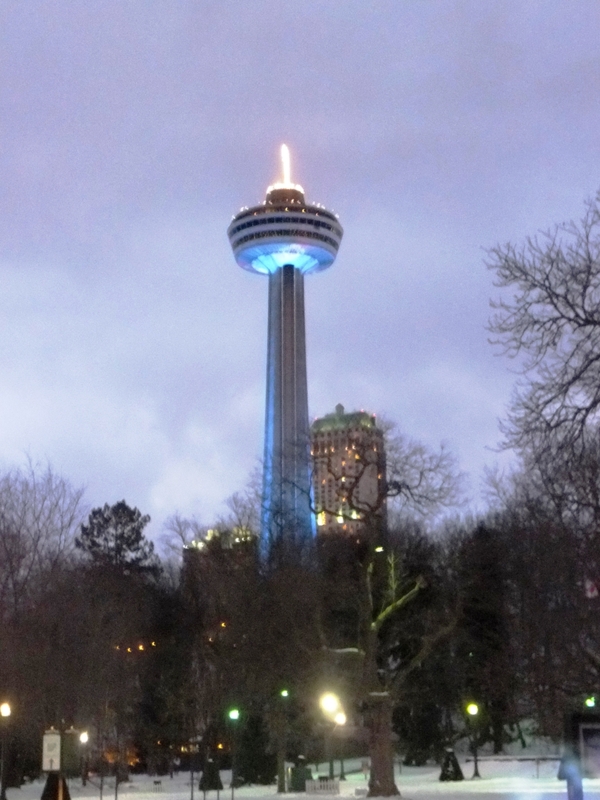 This interesting contraption is one of the famous Niagara Falls travel destinations that has attracted visitors for almost a hundred years. 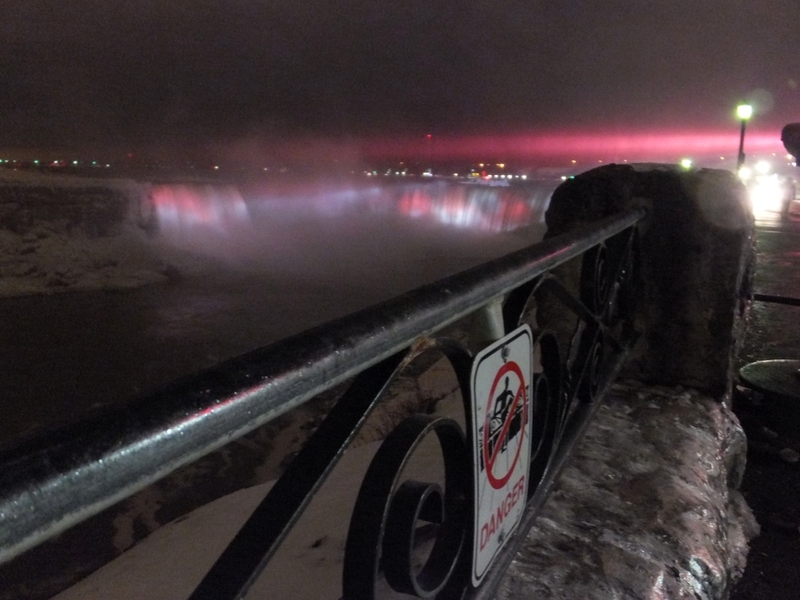 Slowly we approached the city of Niagara Falls, with Niagara Falls, Ontario on the west side of the River, and Niagara Falls, New York, on the east side. 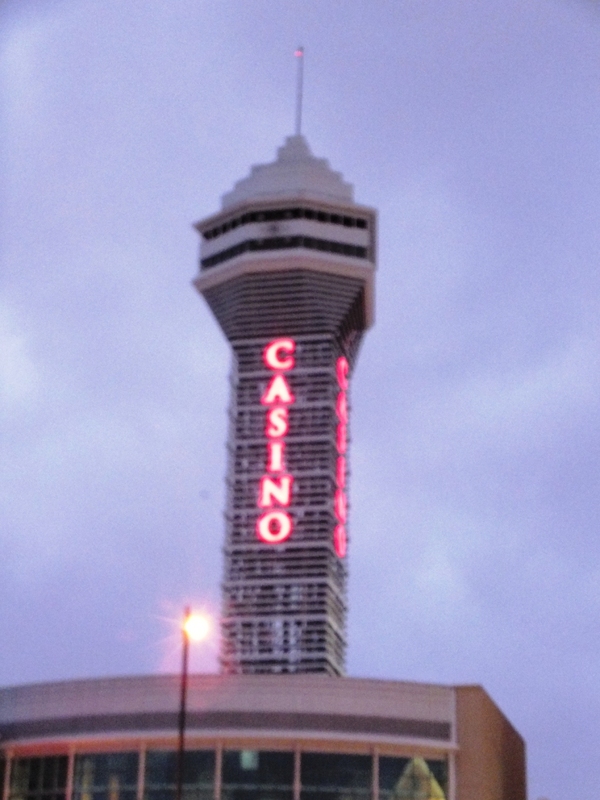 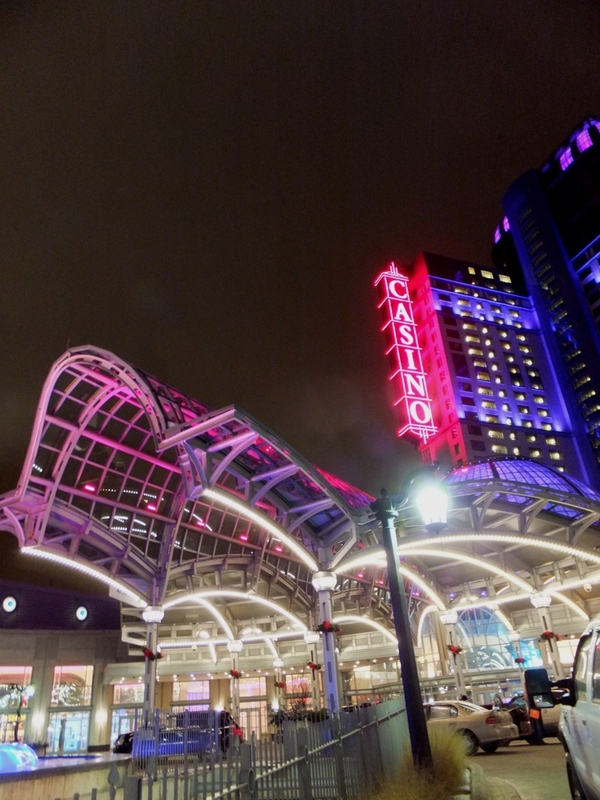 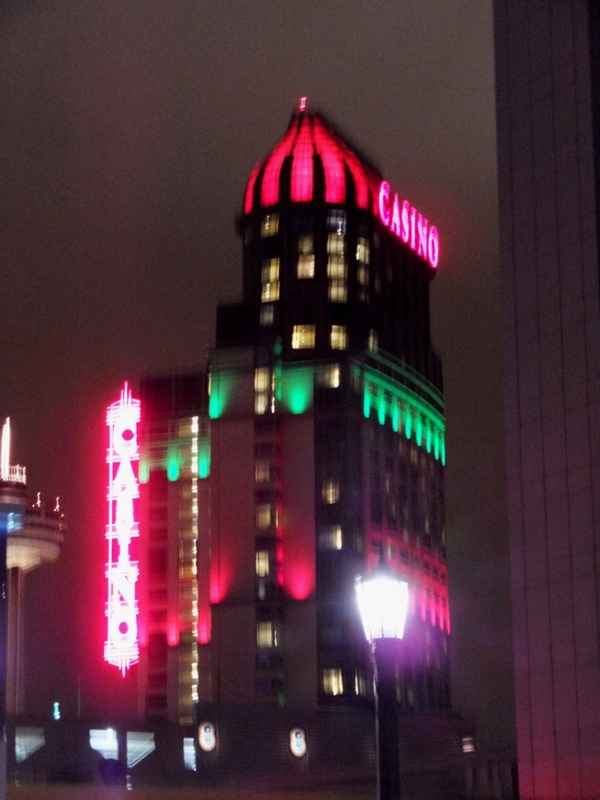 On the Canadian side, Casino Niagara came into view, the older and smaller of the two casinos in Niagara Falls, Ontario. 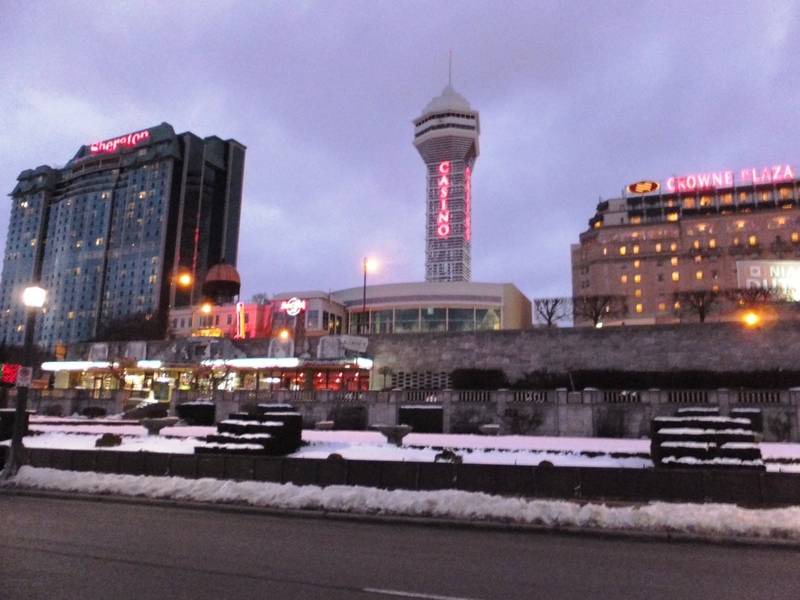 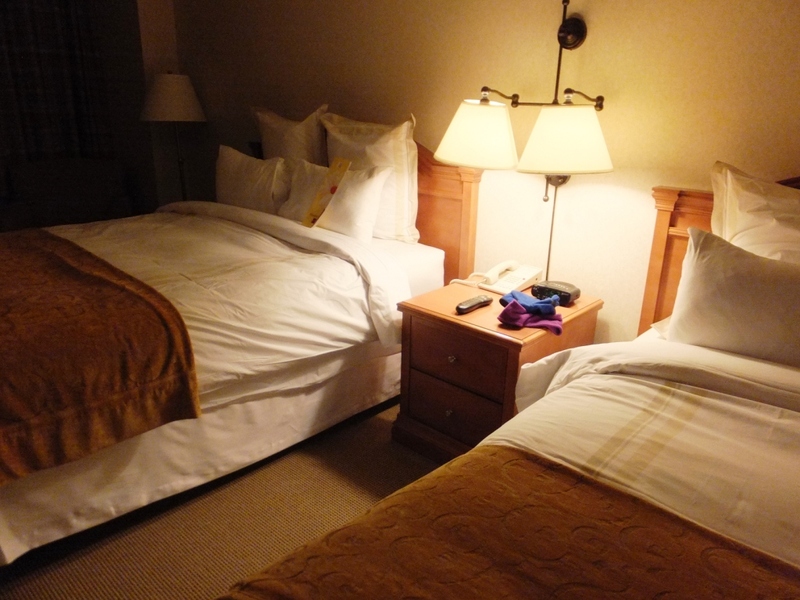 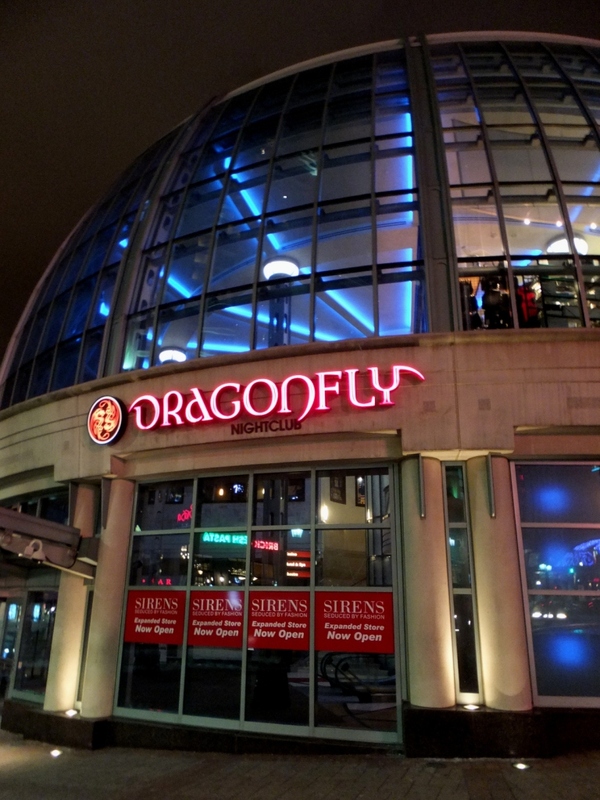 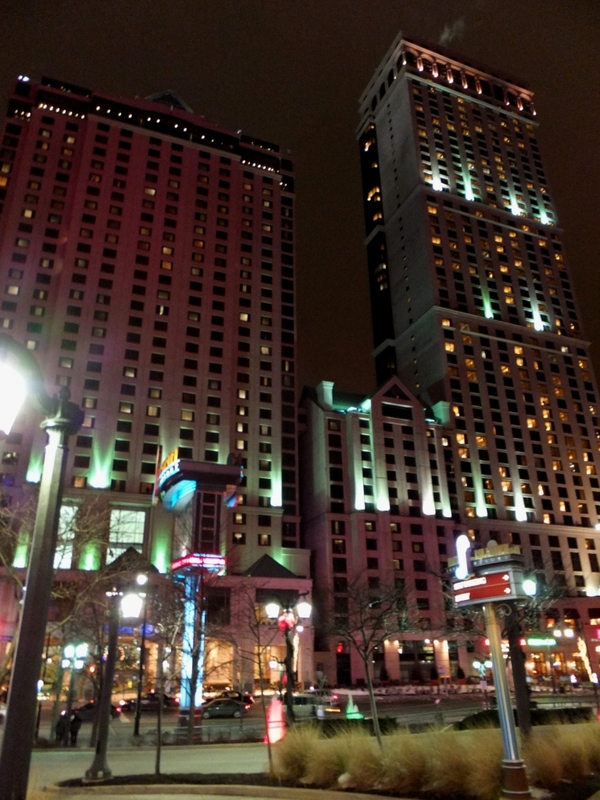 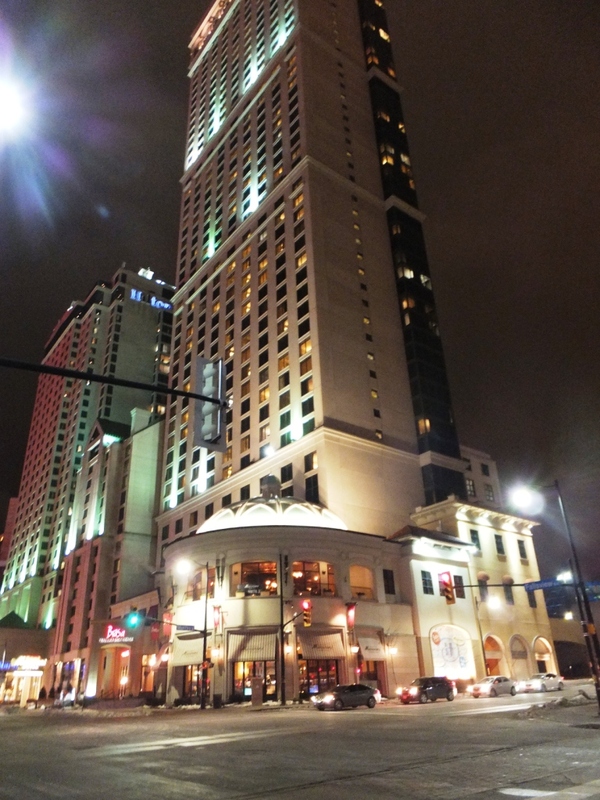 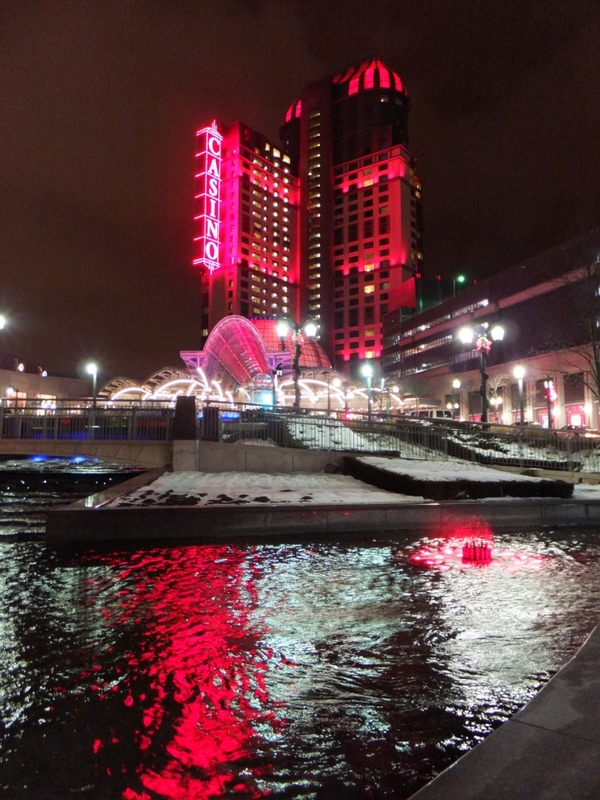 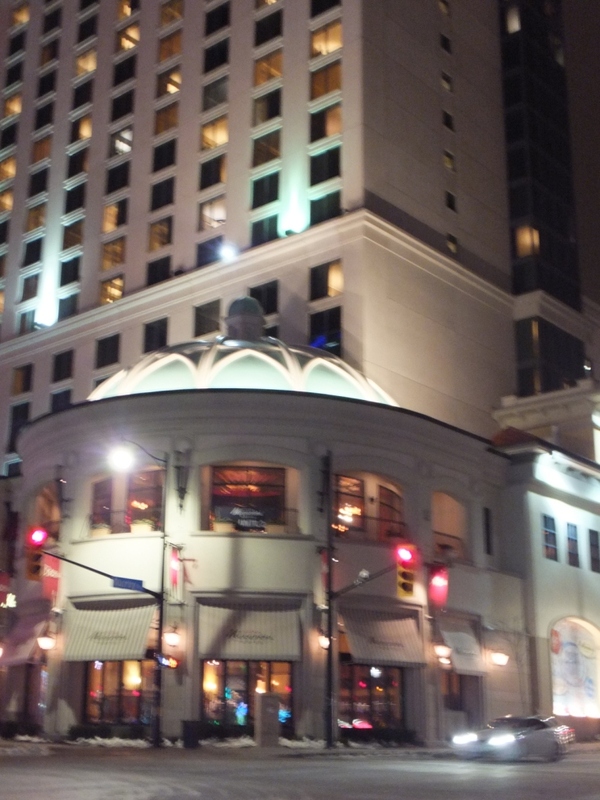 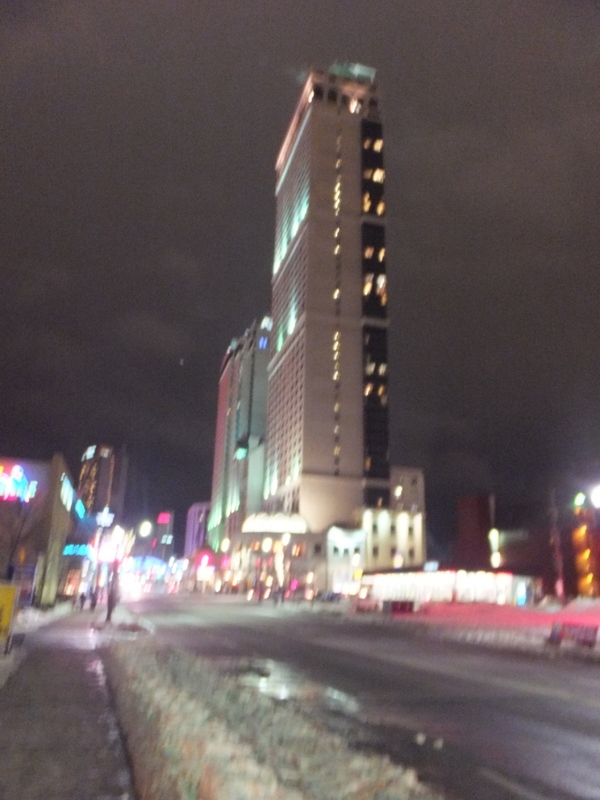 In recent decades, the skyline in Niagara Falls, Ontario, has seen the addition of various high rise hotels and as well the grand Fallsview Casino Resort. 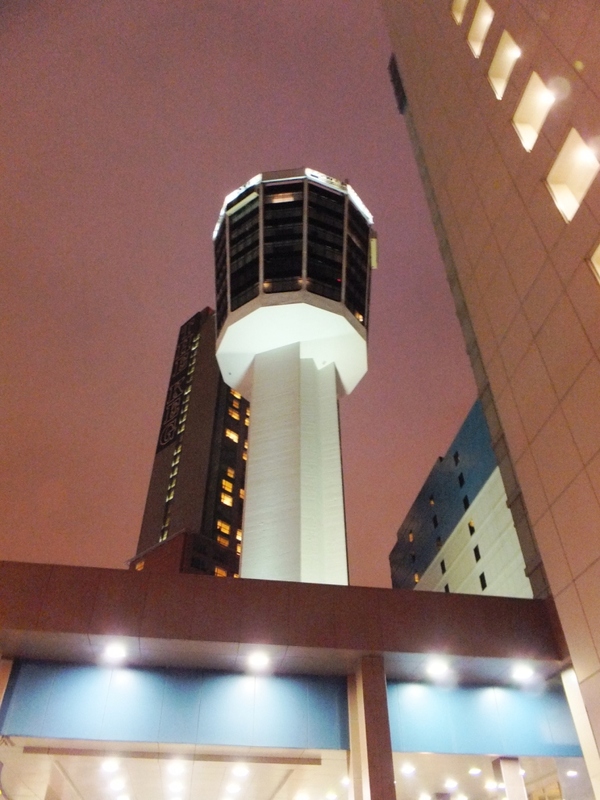 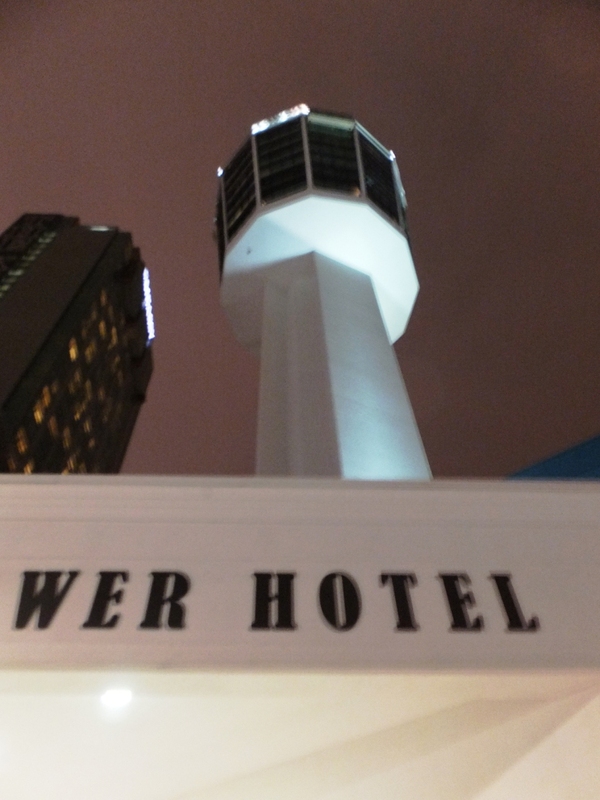 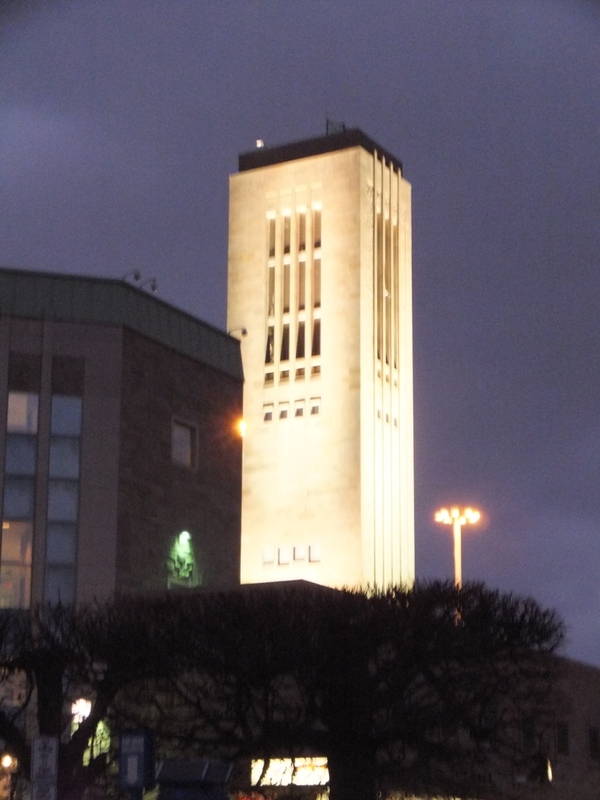 Another landmark, the former Minolta Tower (now the Tower Hotel), has been watching over the Falls since 1962 as the first modern observation tower. 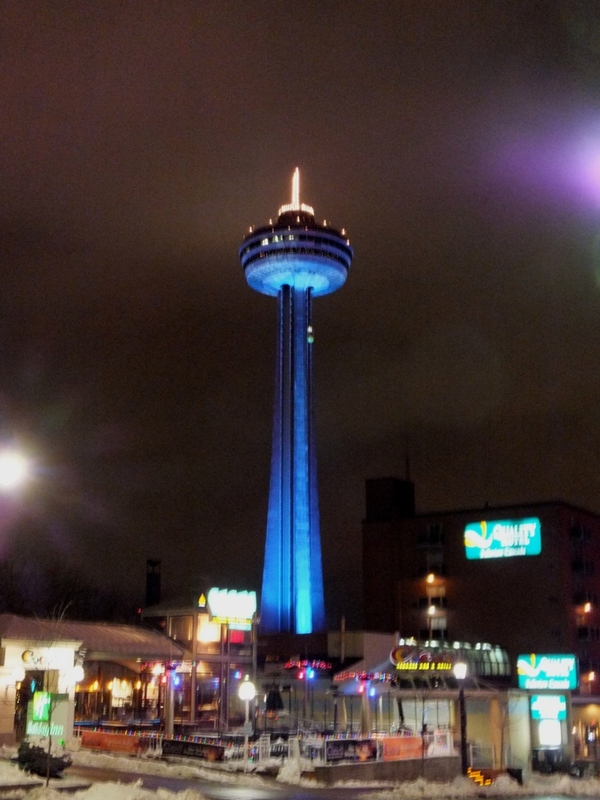 Together with the iconic Skylon Tower (which opened in 1965), the skyline of Niagara Falls, Ontario, has become a rather impressive miniature version of Las Vegas. 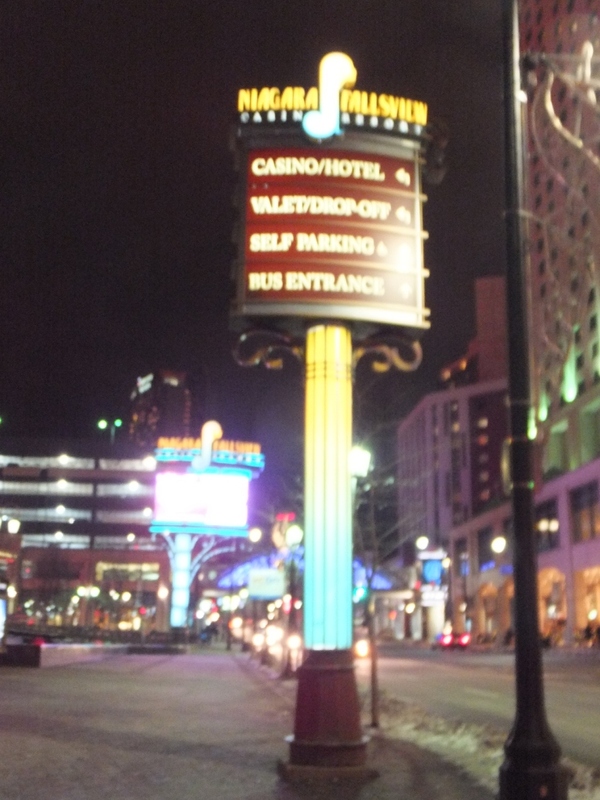 After checking in at the Marriott Hotel at the top of the hill in the Fallsview district, where we had a room with a perfect view of the Falls, we embarked on an evening stroll, past the Fallsview Casino and down Murray Street whose street lamps were attractively illuminated with neon blue stars. 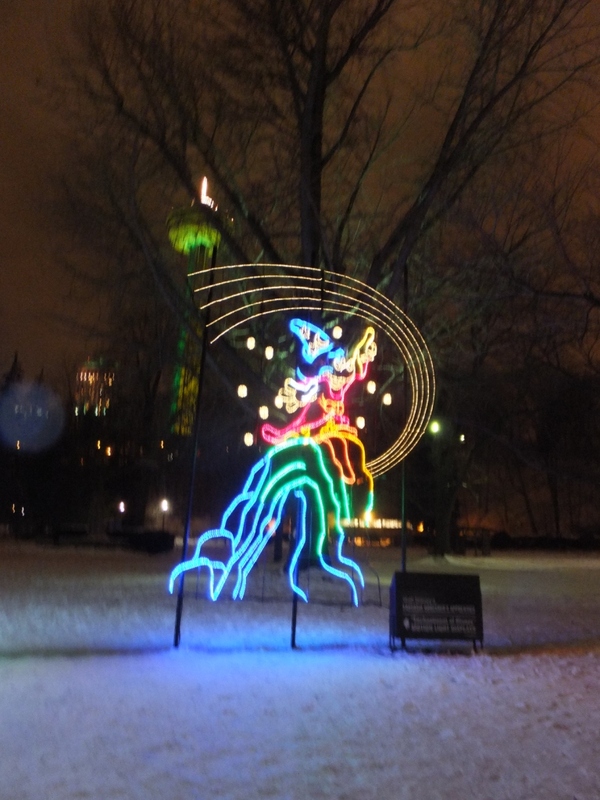 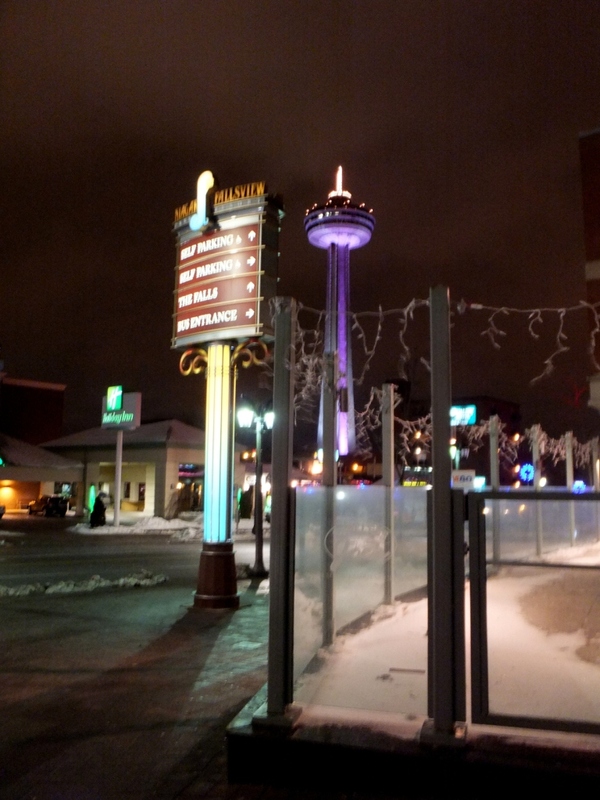 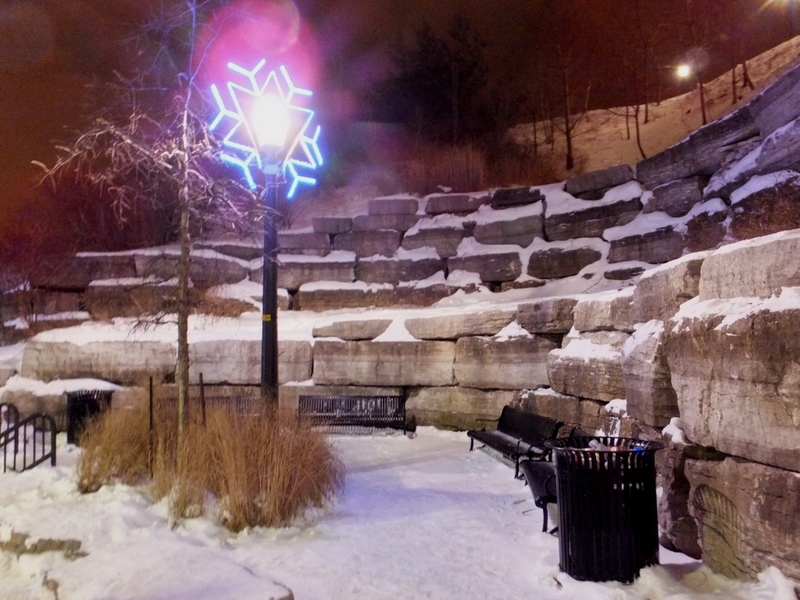 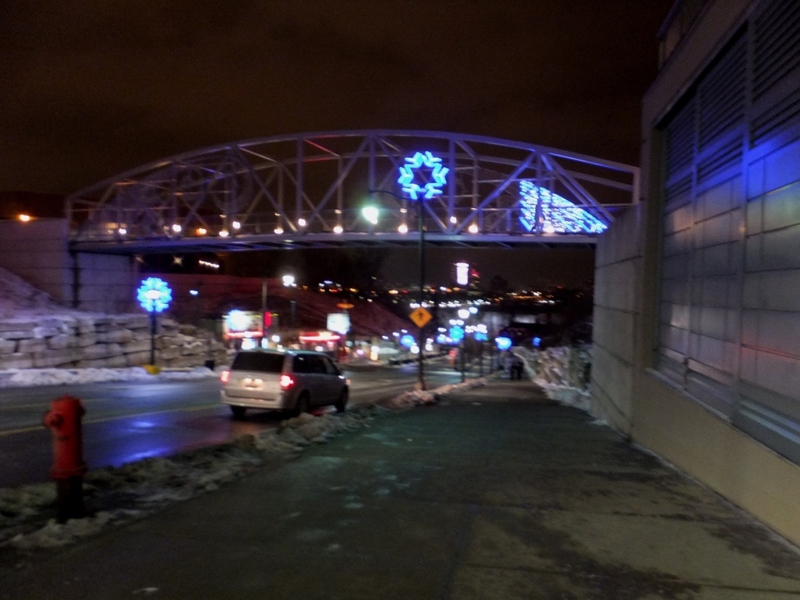 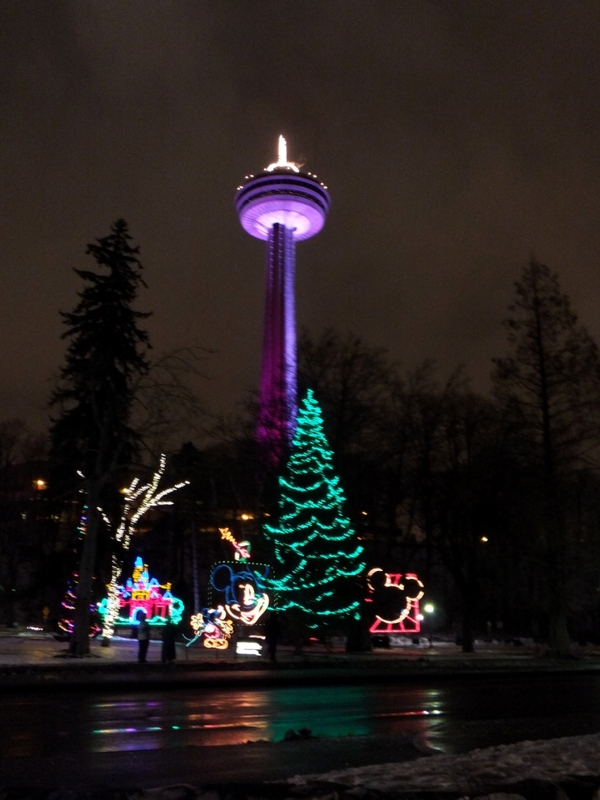 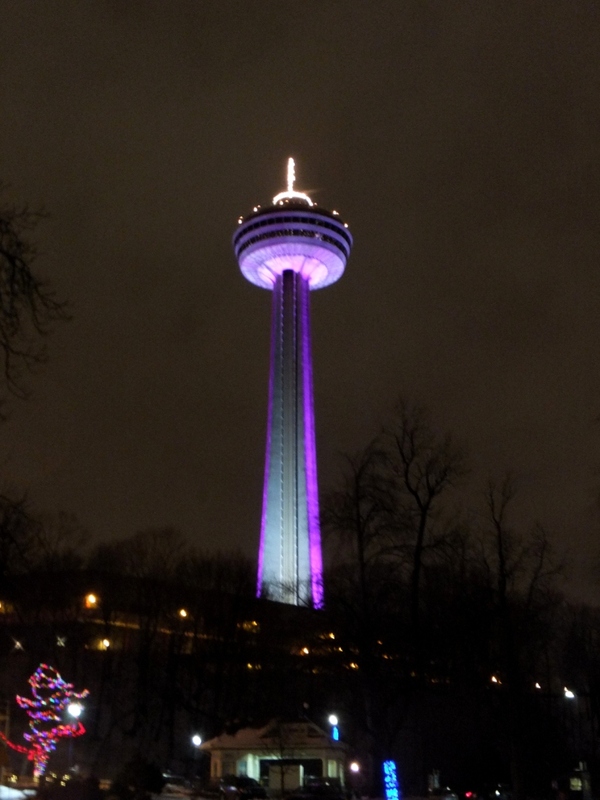 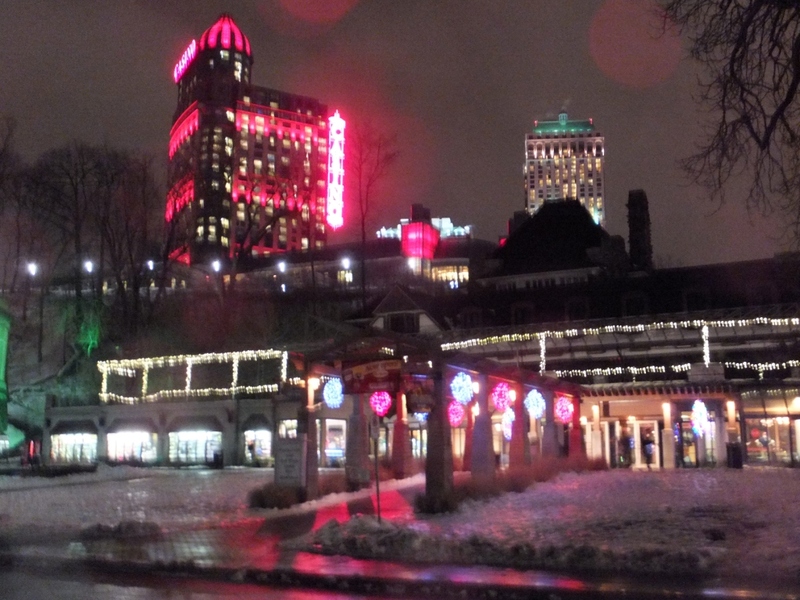 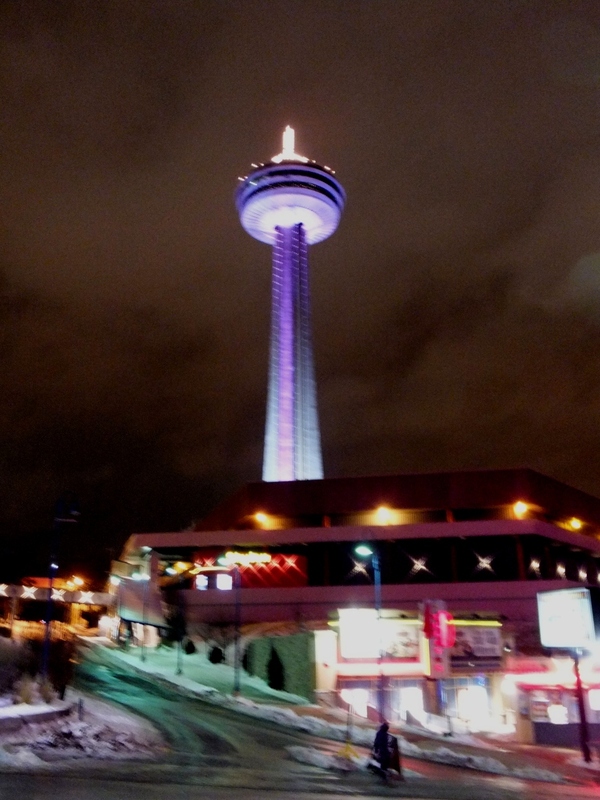 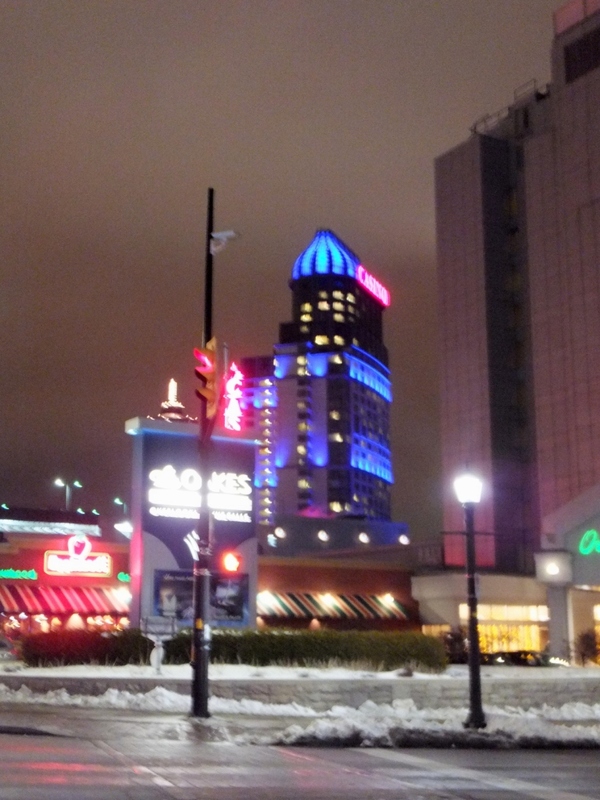 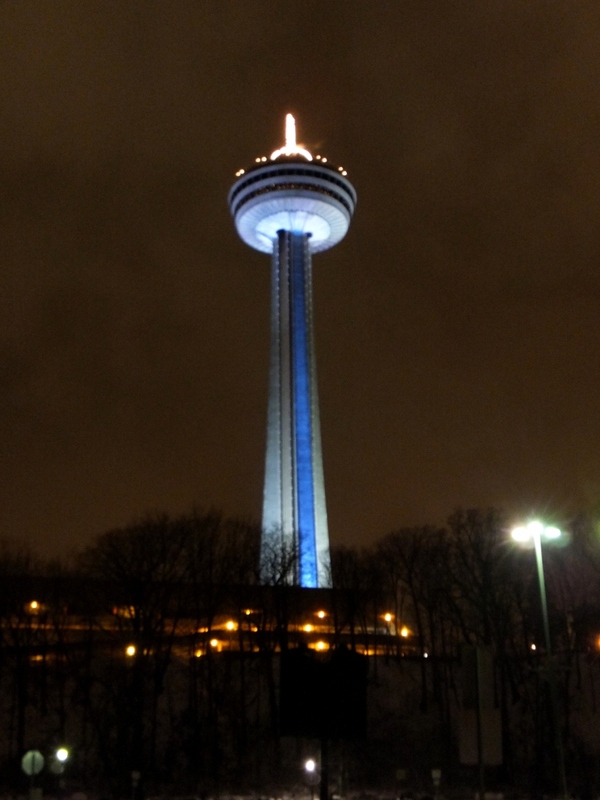 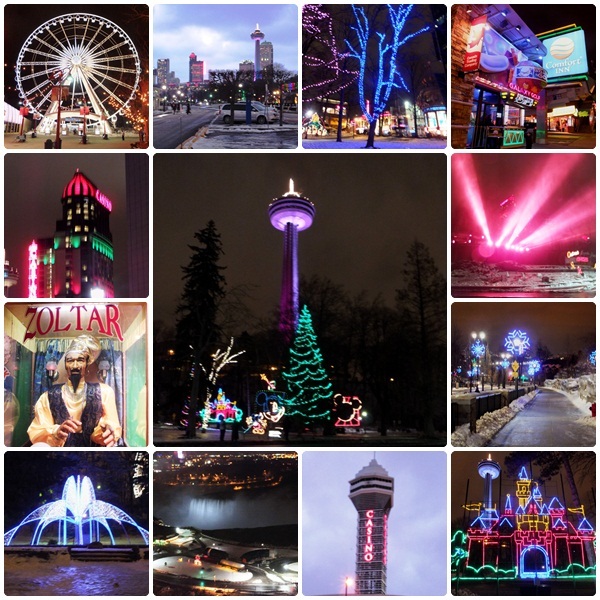 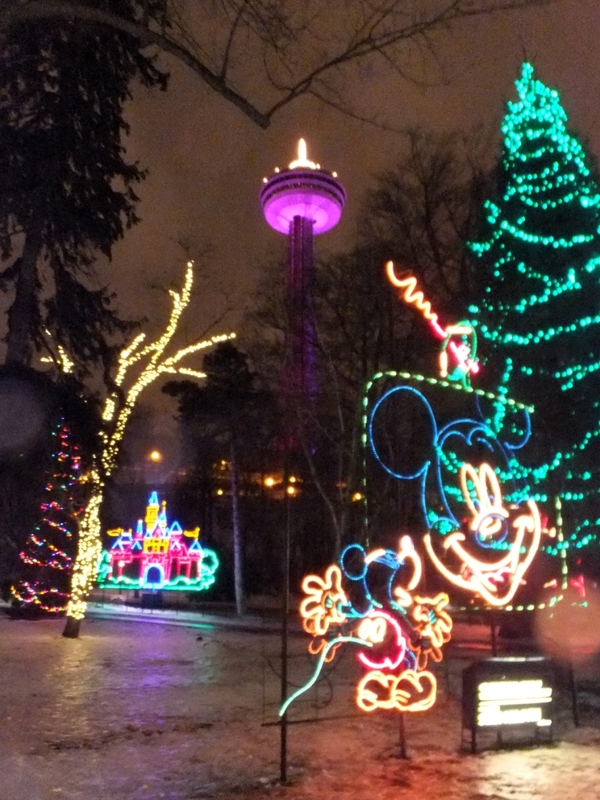 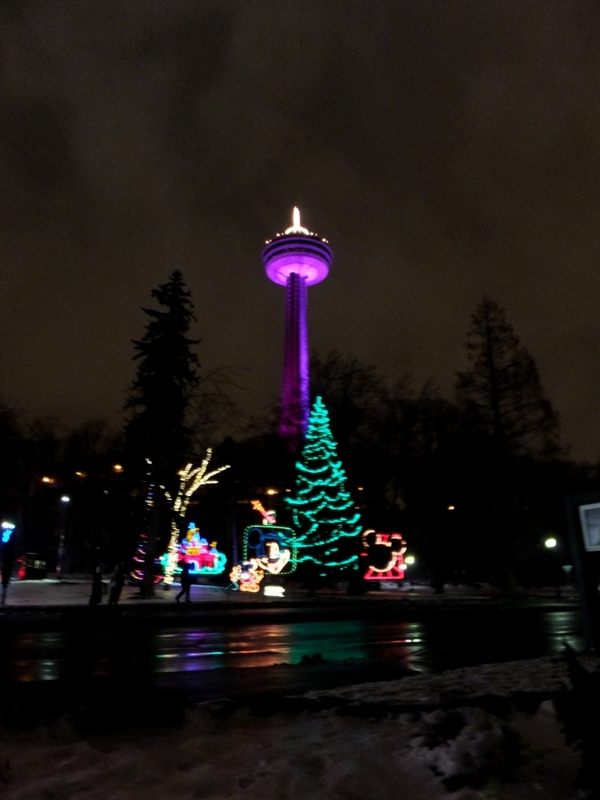 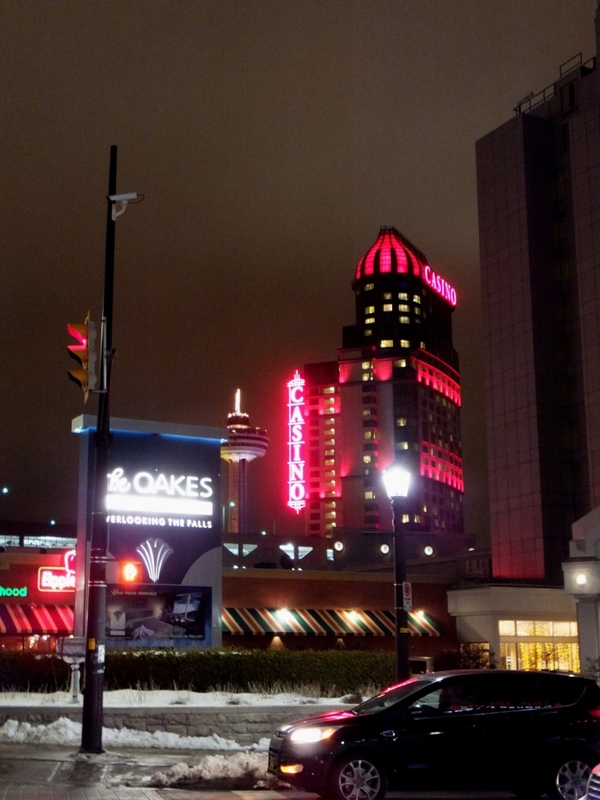 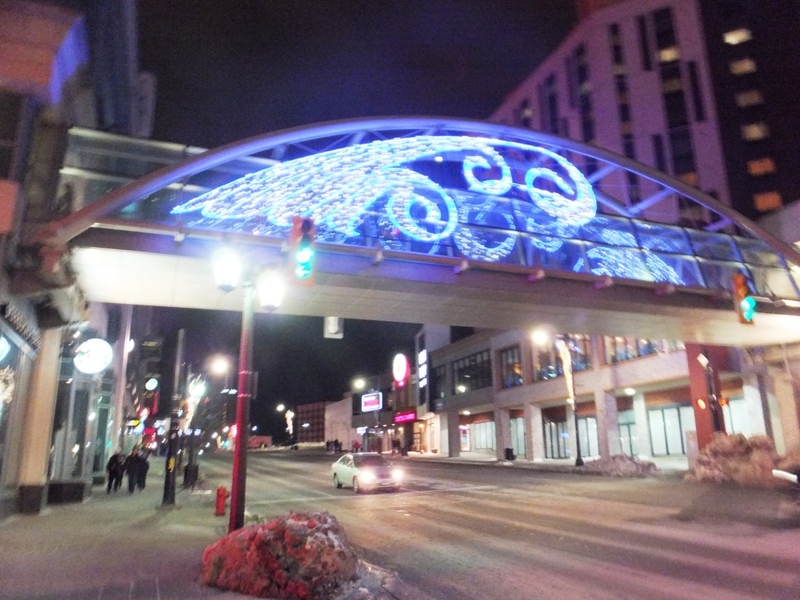 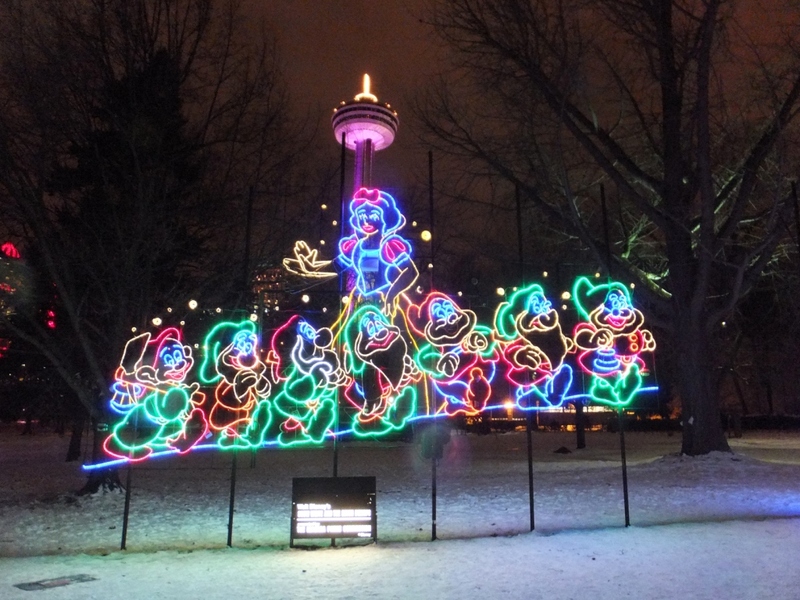 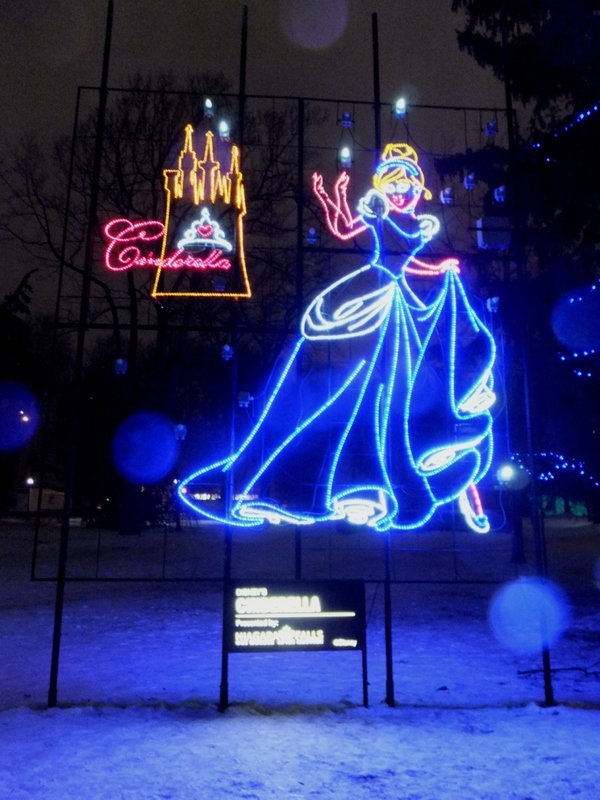 The Skylon Tower was illuminated in shades of green, blue, purple and red and at the bottom of Murray Street we admired a large collection of colourfully lit displays of Disney characters, all part of the CAA Festival of Lights. 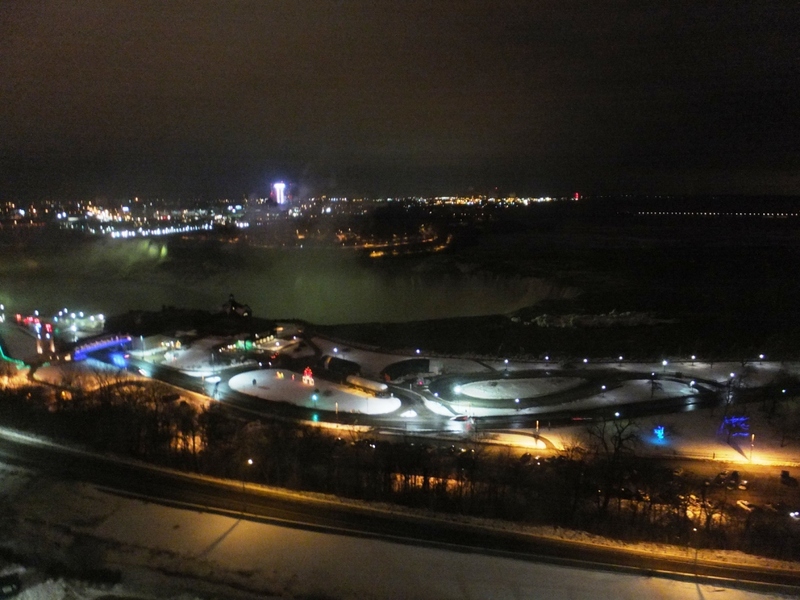 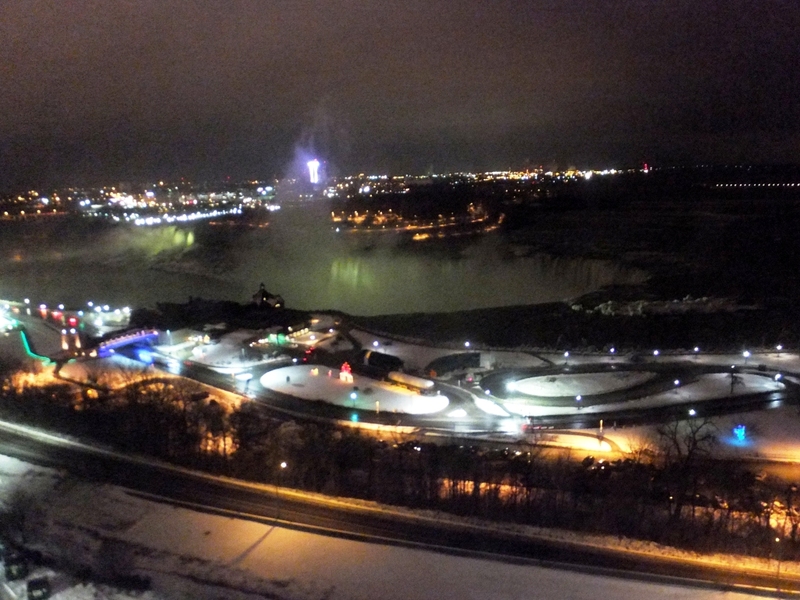 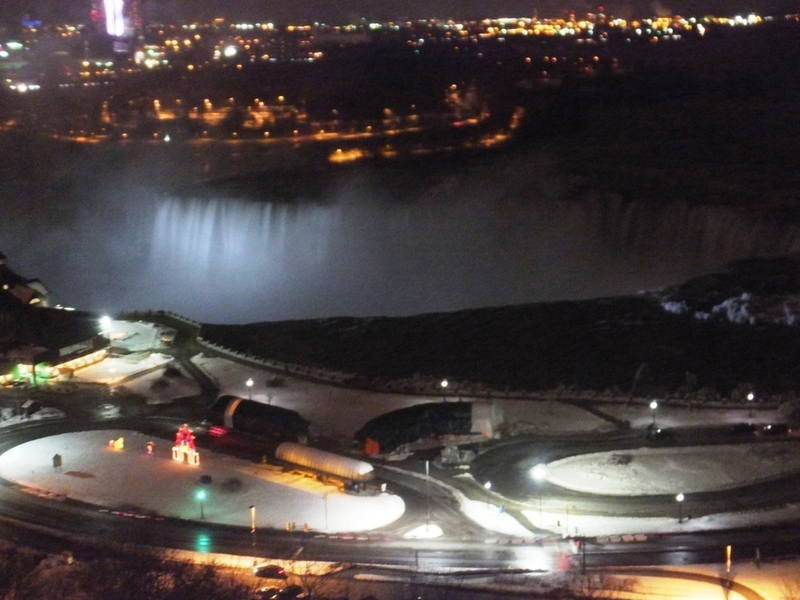 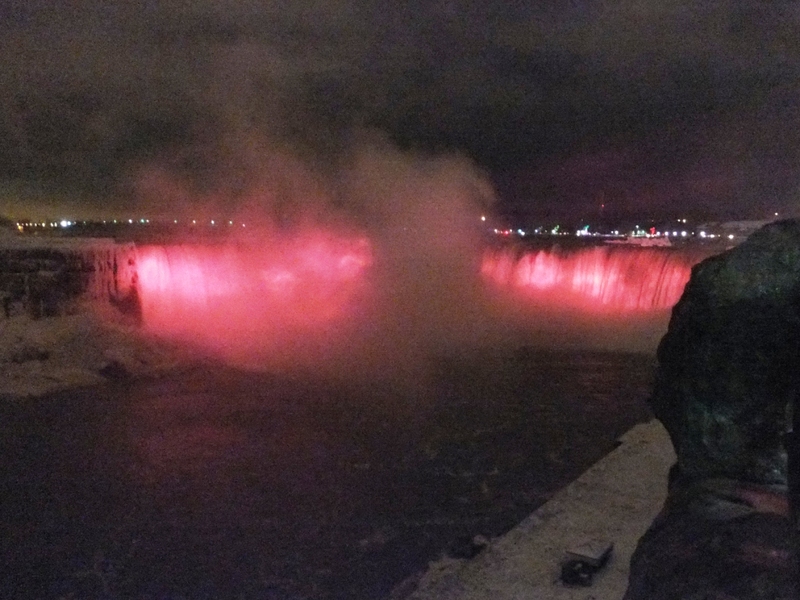 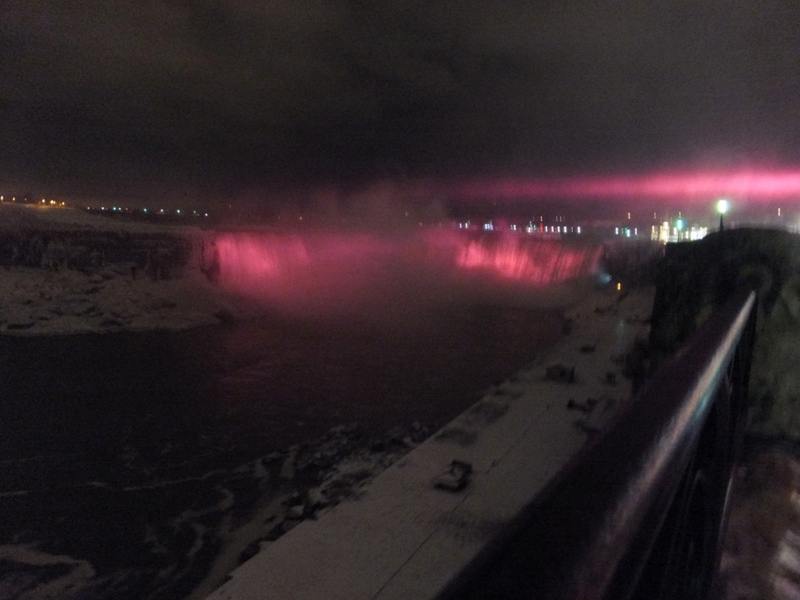 The American Falls were also lit up and looked like a white curtain while the Canadian Horseshoe Falls were illuminated in changing colours, a nightly tradition provided by the Niagara Falls Illumination Board since 1925. 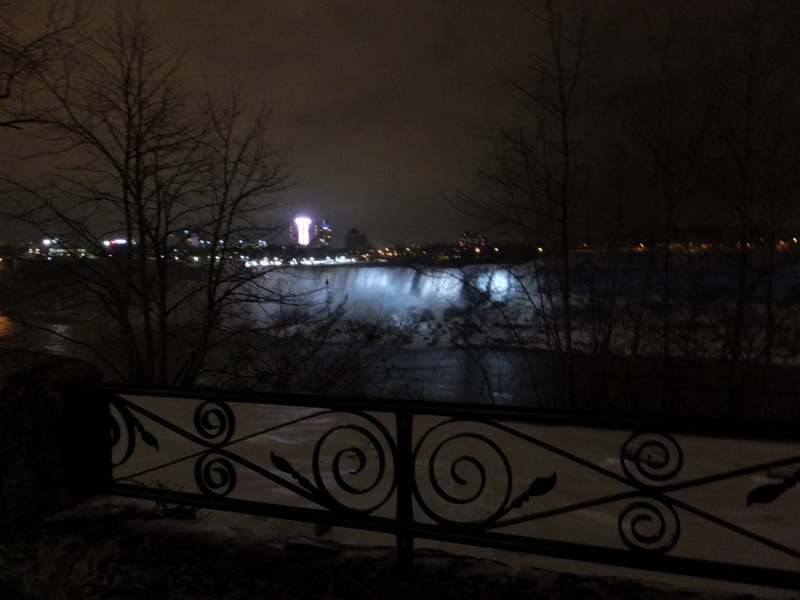 We tried to get close to the Canadian Falls, but the walkway was so icy that we had to turn around. 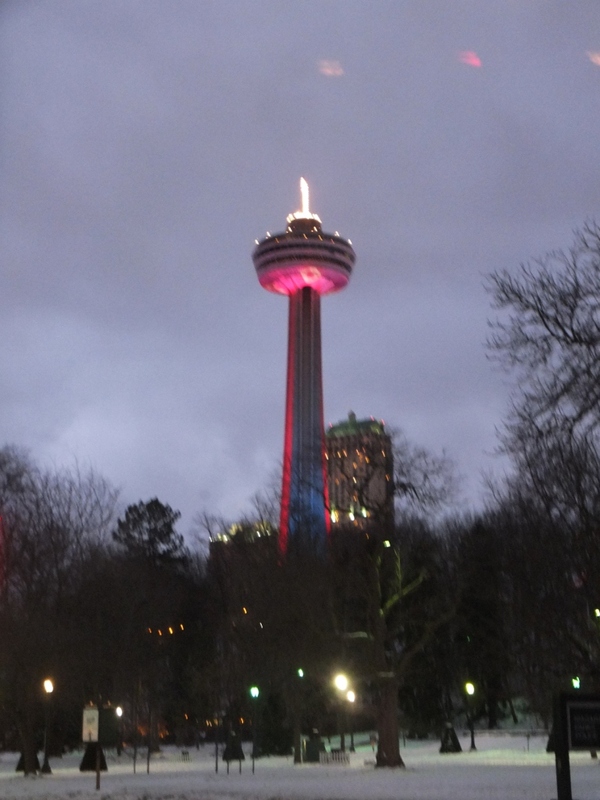 So we started to walk northwards beside the Niagara Parkway in the direction of the Rainbow Bridge. 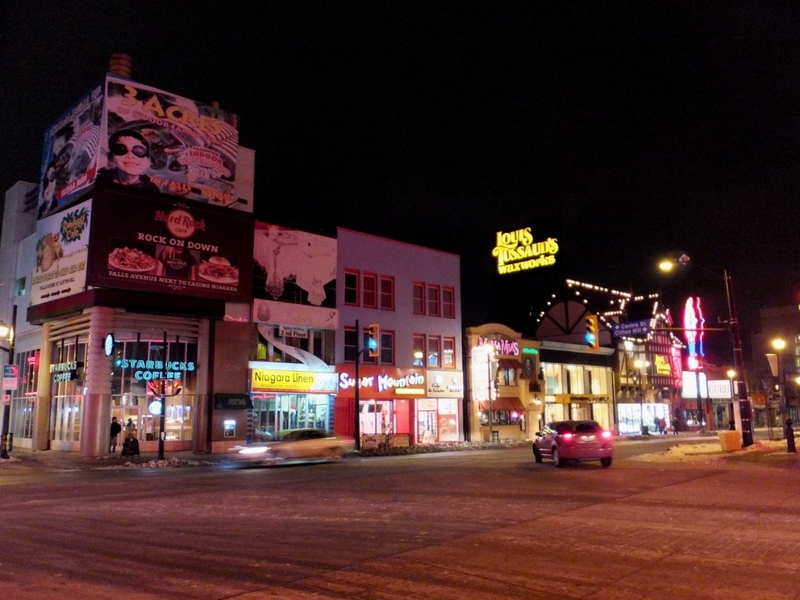 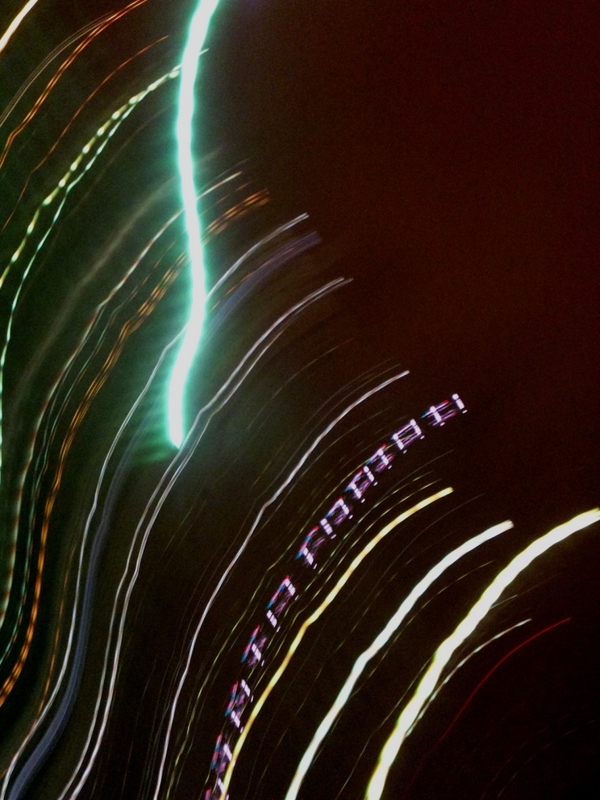 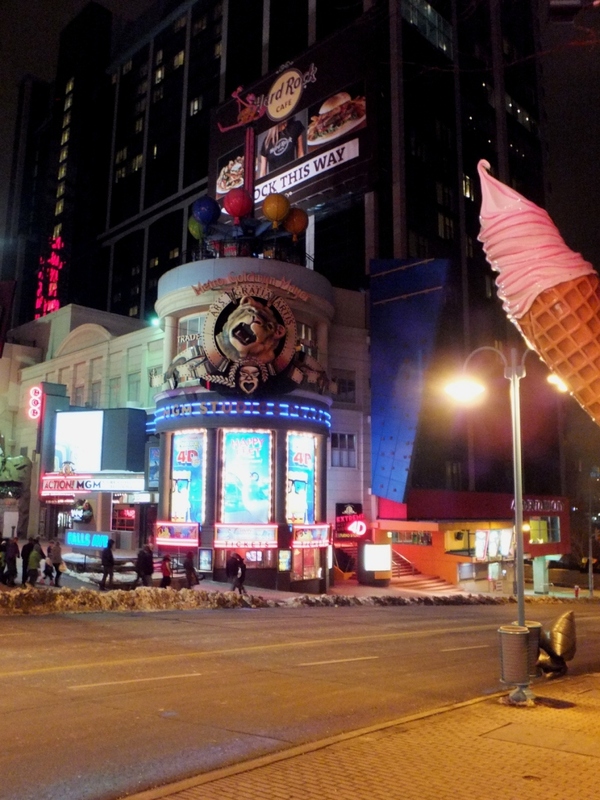 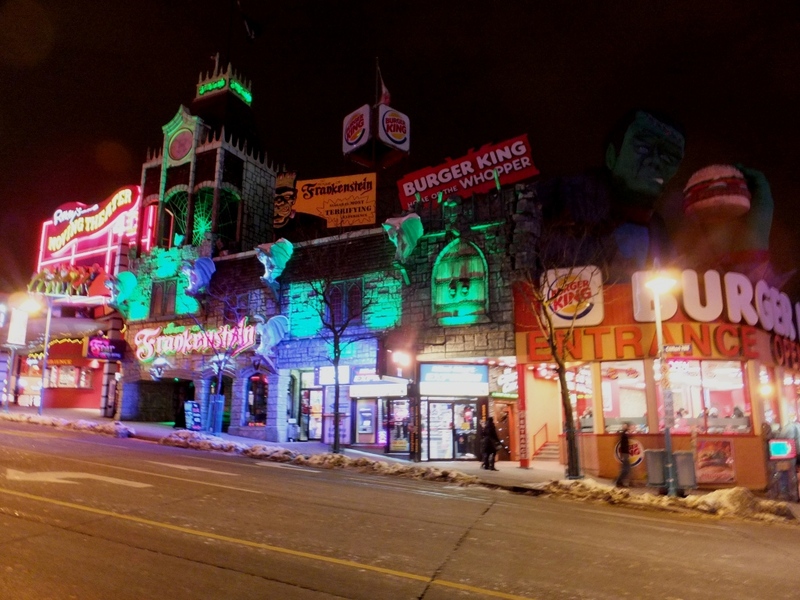 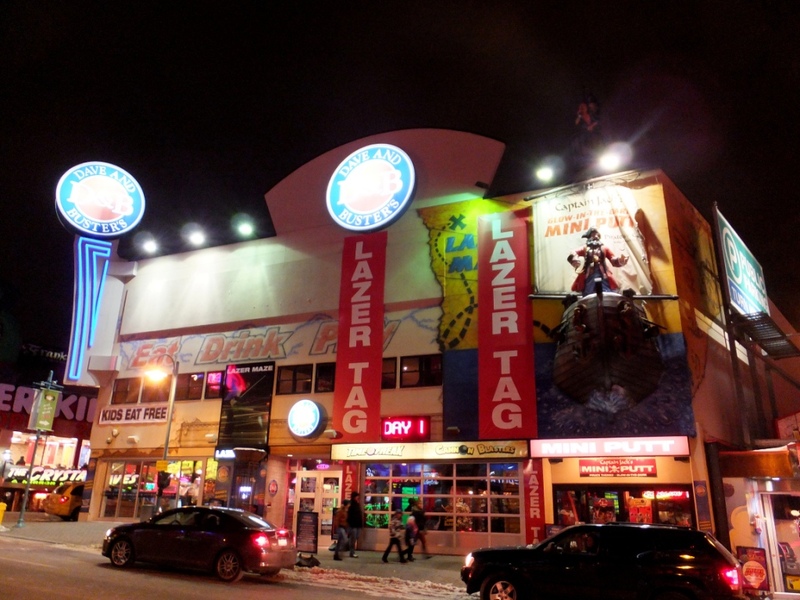 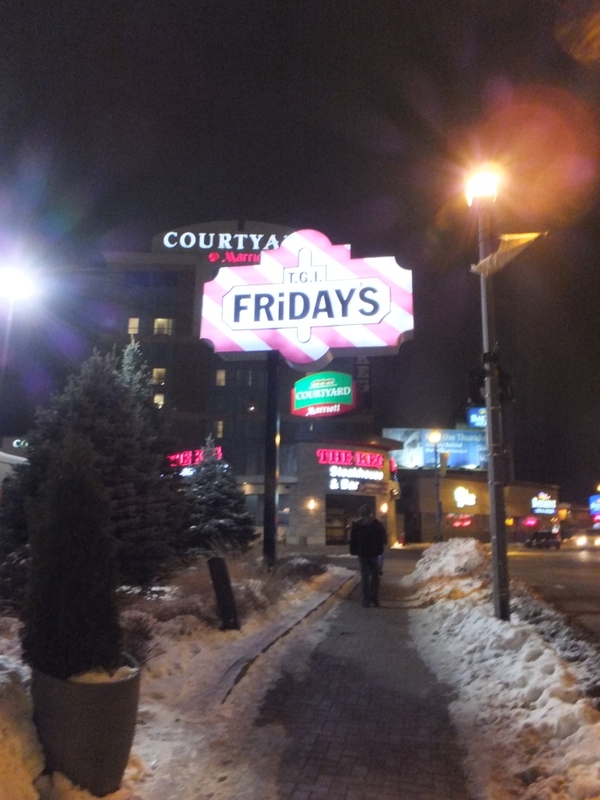 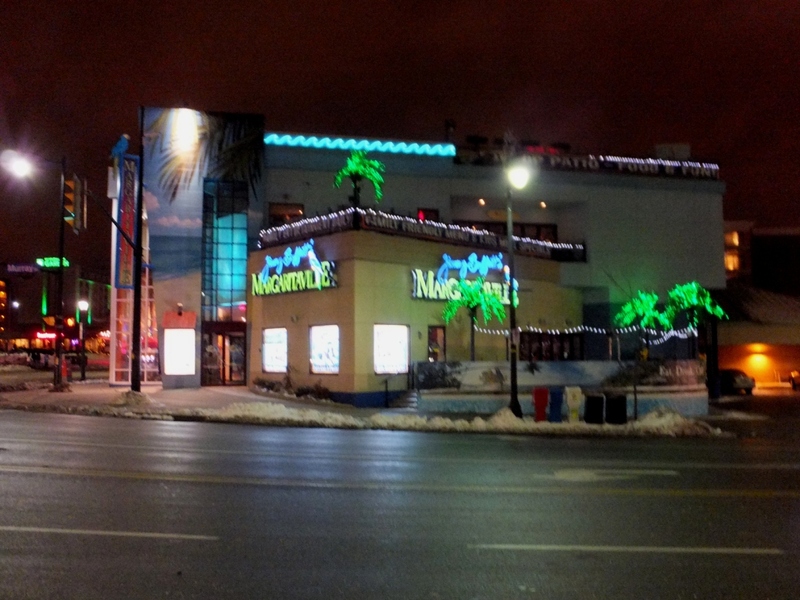 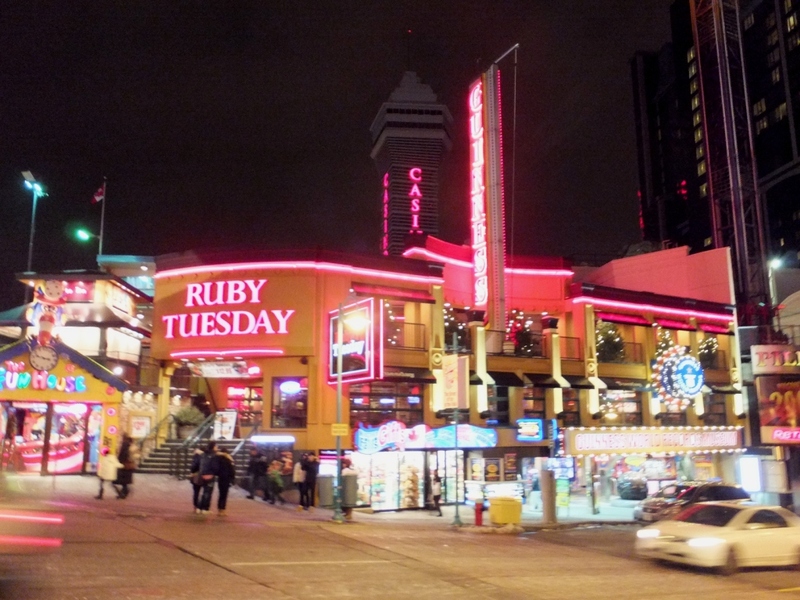 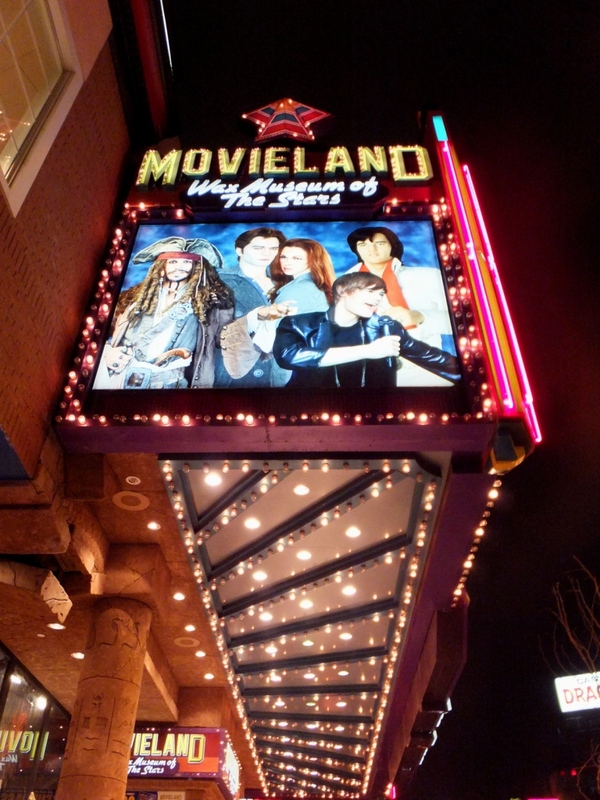 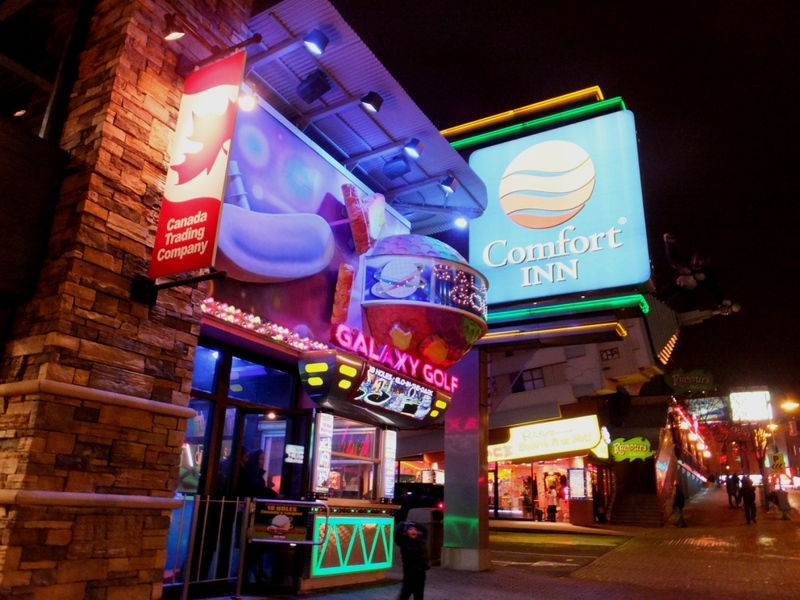 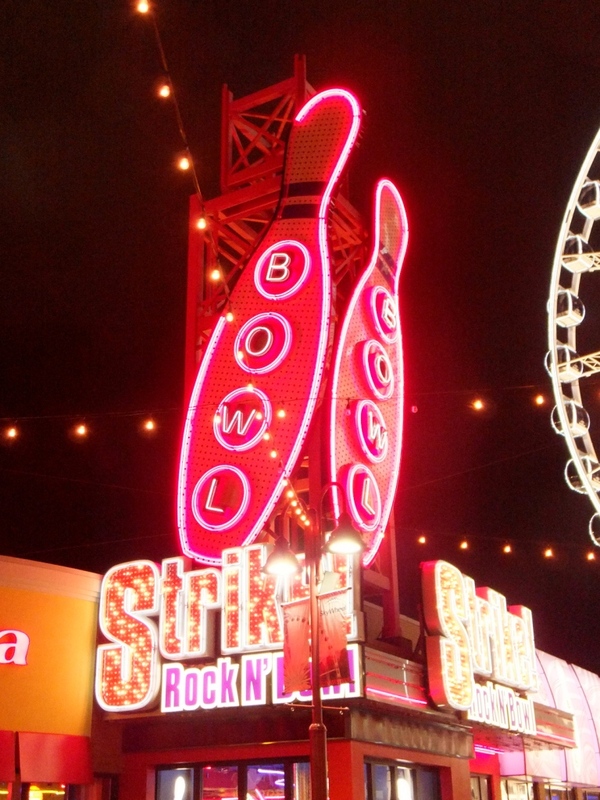 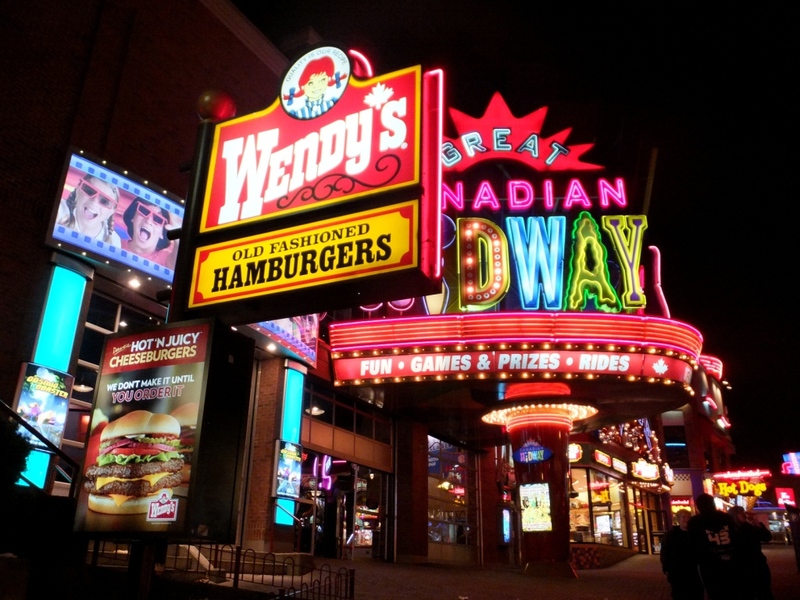 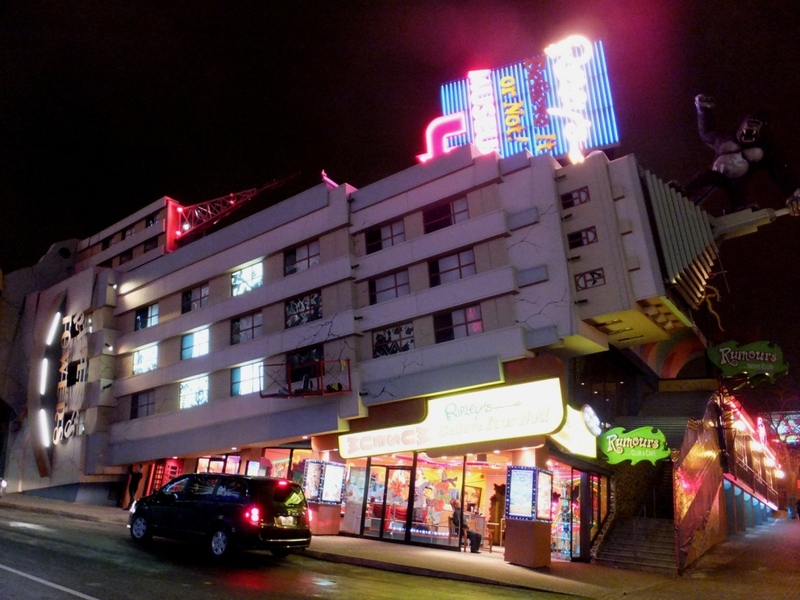 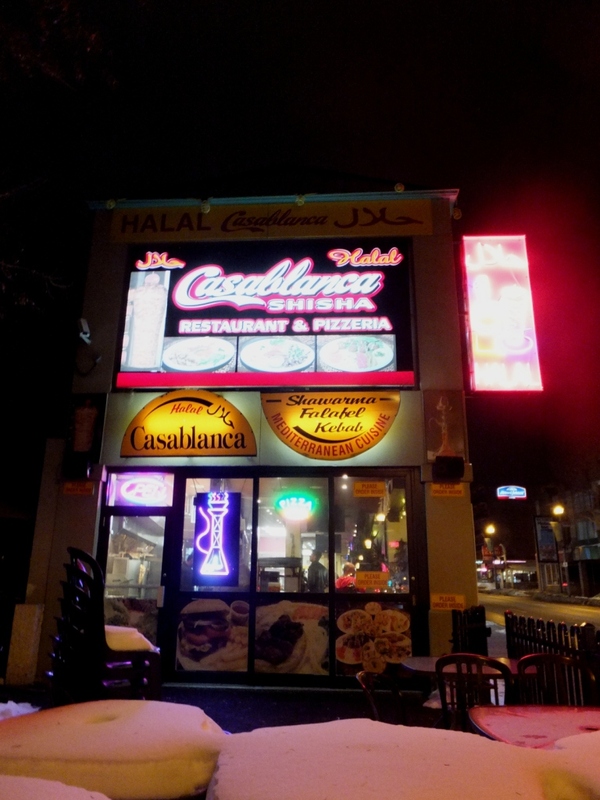 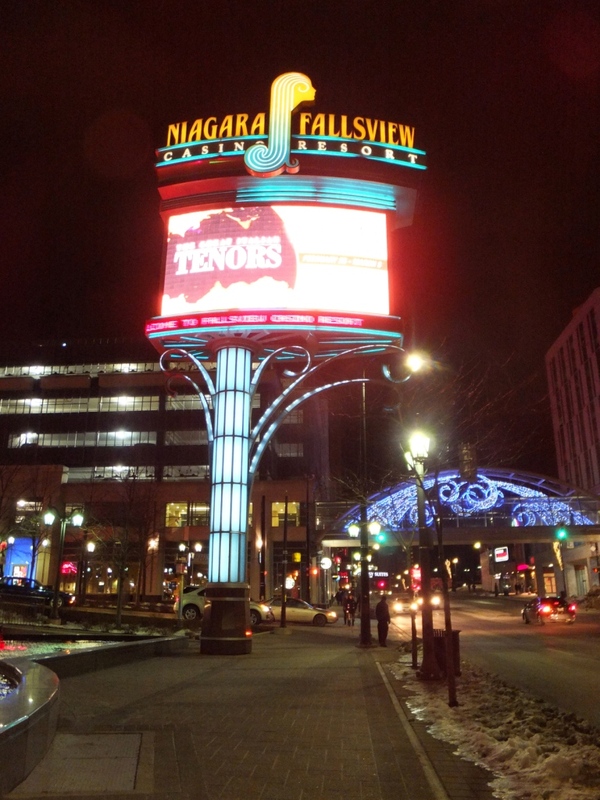 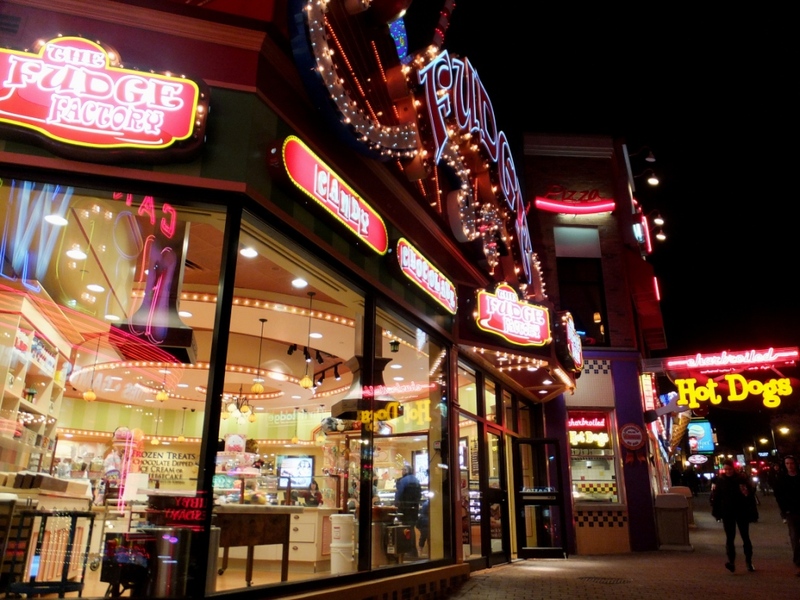 Then we turned left on Clifton Hill, the brightly lit entertainment street in Niagara Falls, Ontario. 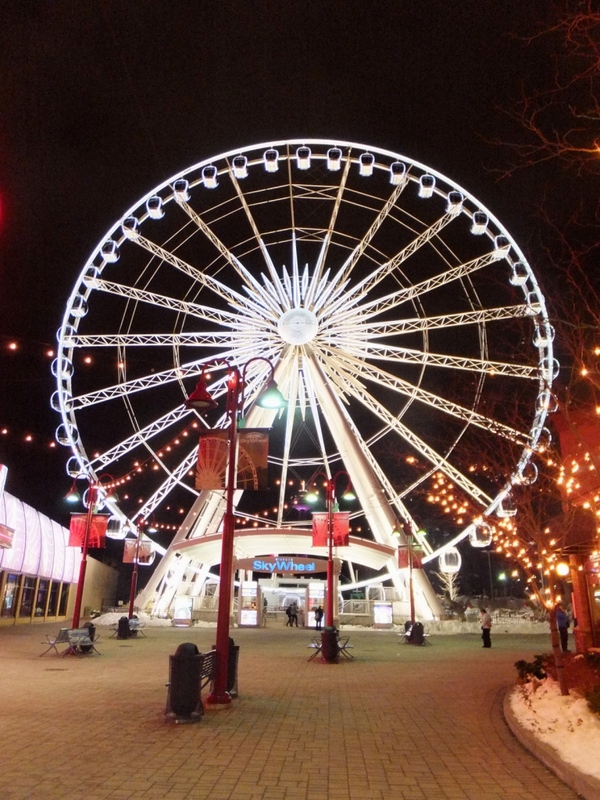 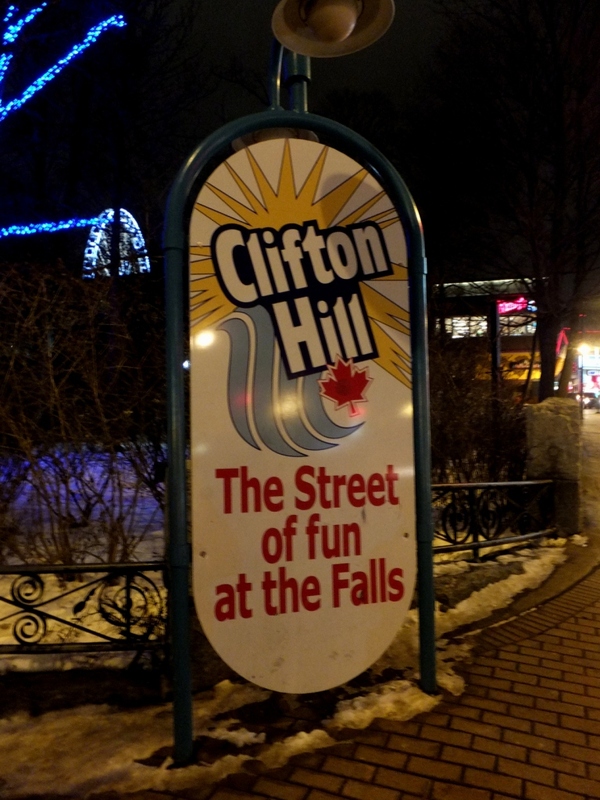 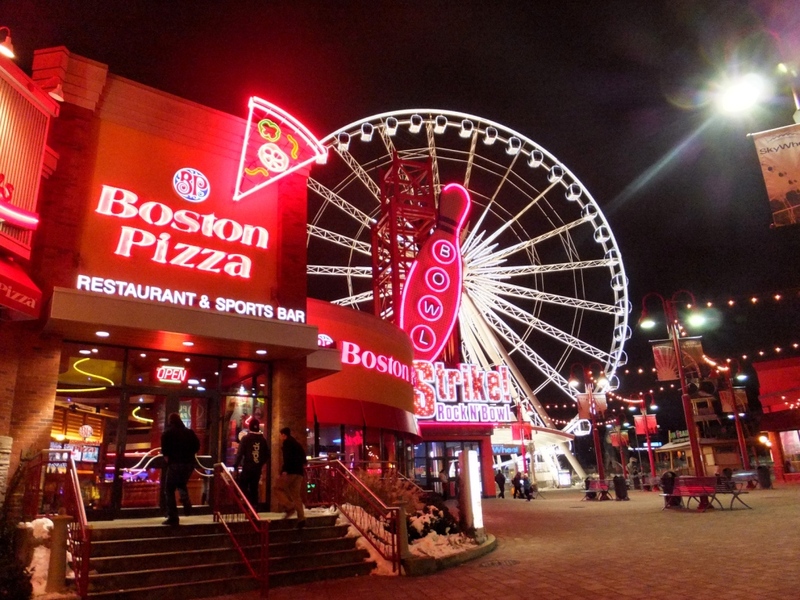 Clifton Hill is full of attractions such as the stunningly illuminated Niagara Skywheel which allows visitors to view the Falls from a height of 175 feet. 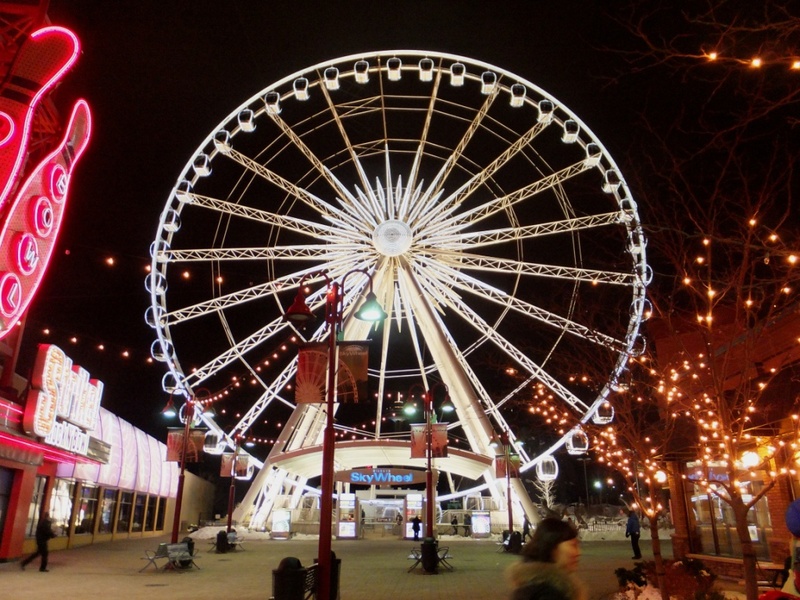 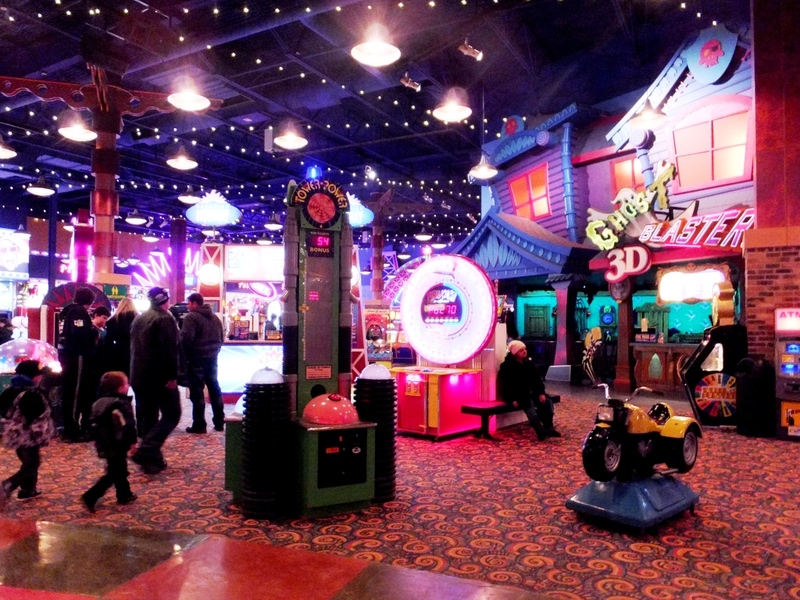 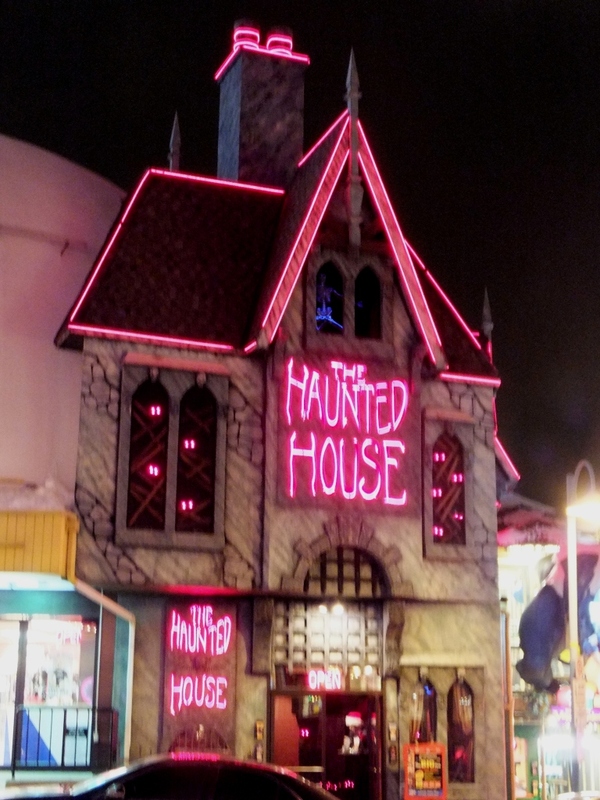 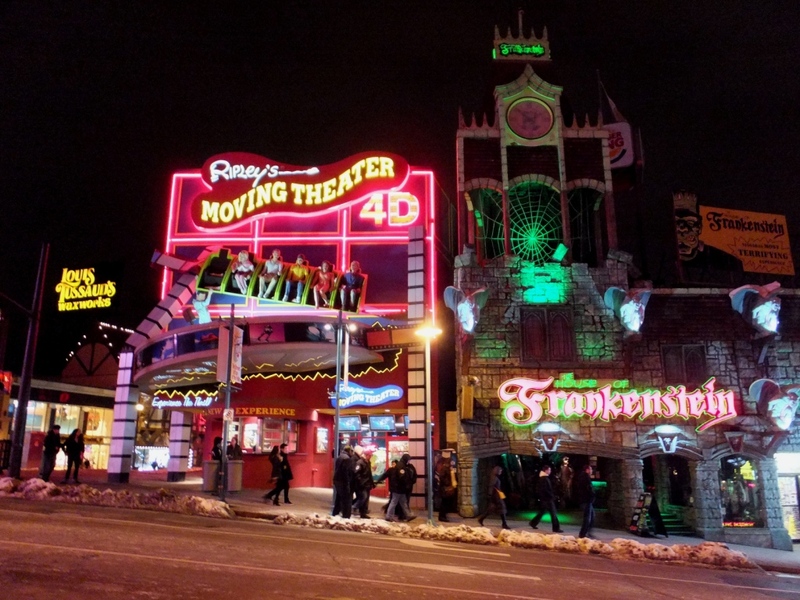 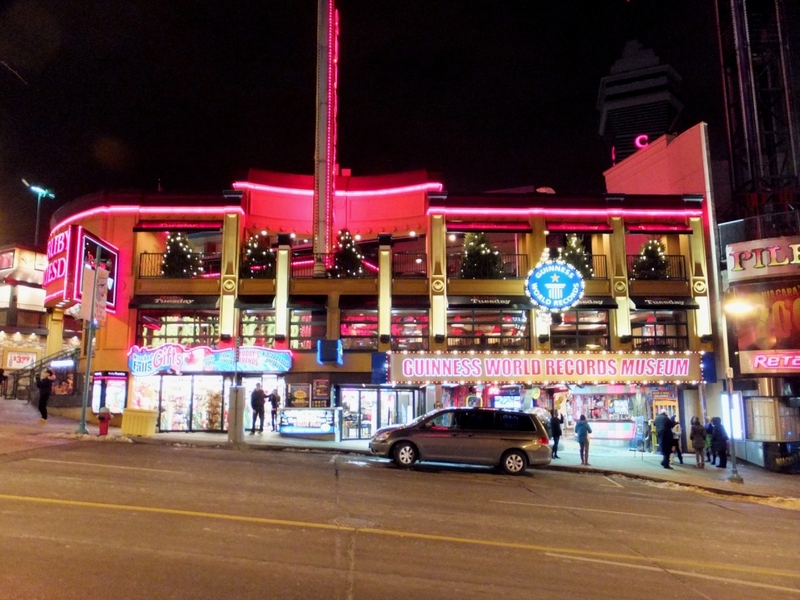 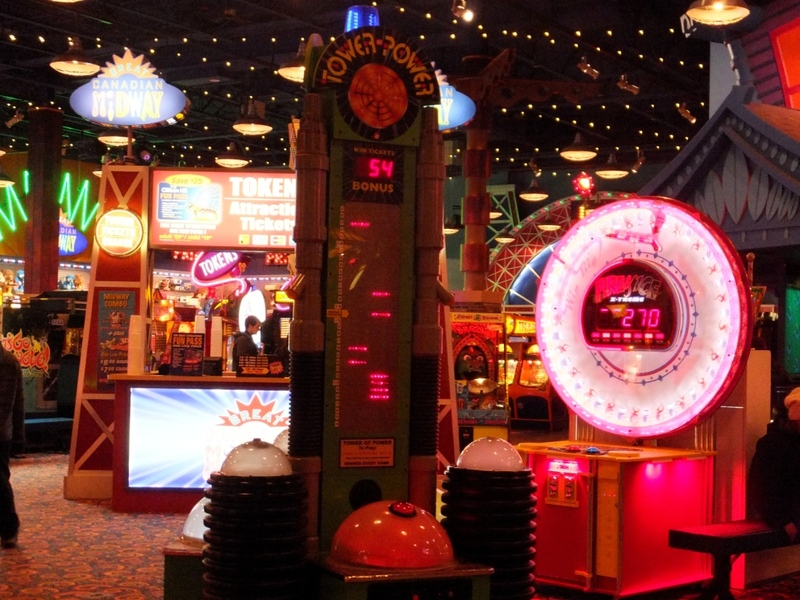 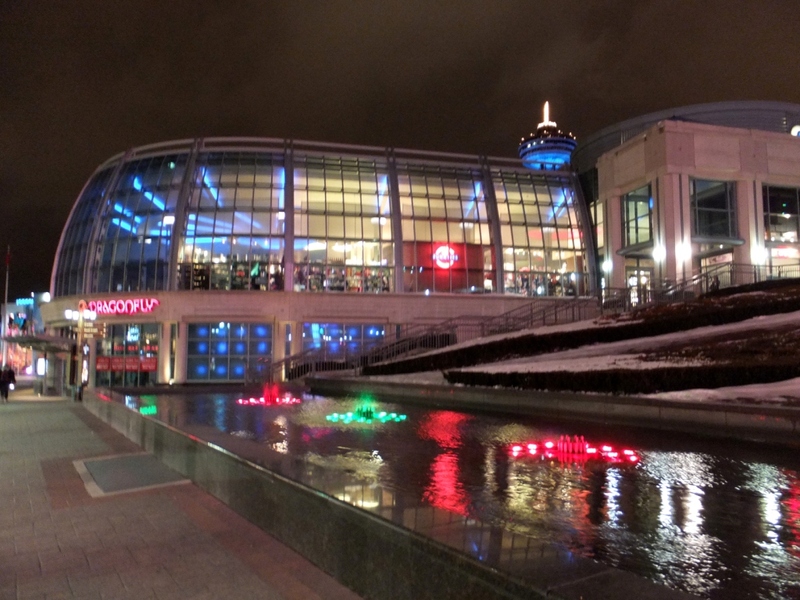 Various other brightly lit attractions beckon such as Ripley’s Museum, the Dinosaur Adventure, Movieland, Galaxy Golf and the Canadian Midway, 70,000 square feet of fun and games. 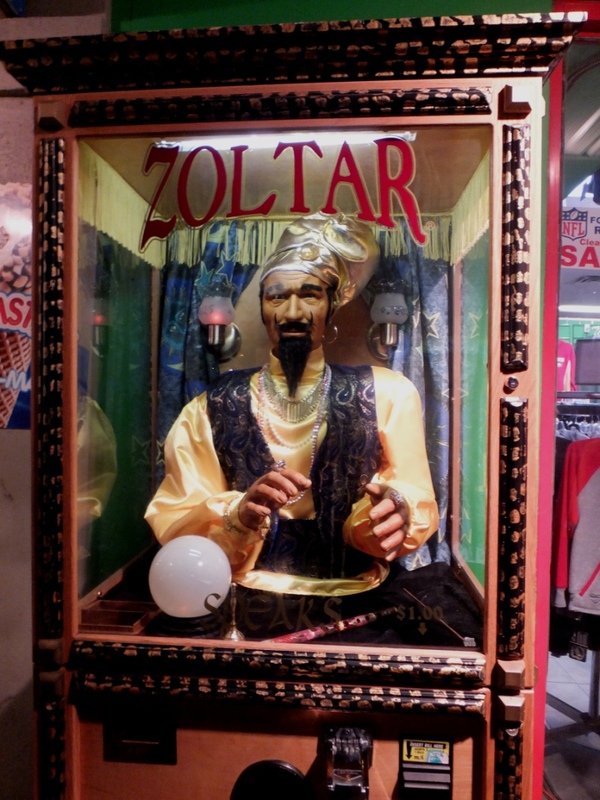 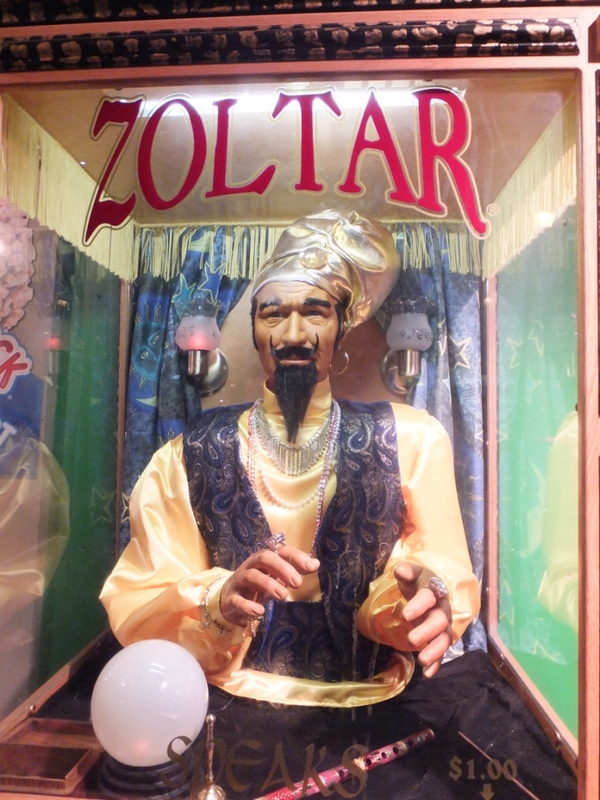 On the way back to the Marriott Hotel we walked along Victoria Avenue, caught a glimpse of Louis Tussaud’s Waxworks, and passed by the coin-operated mechanical fortune teller Zoltar who was waiting to entice passers-by to drop some coins to share his wisdom with them. 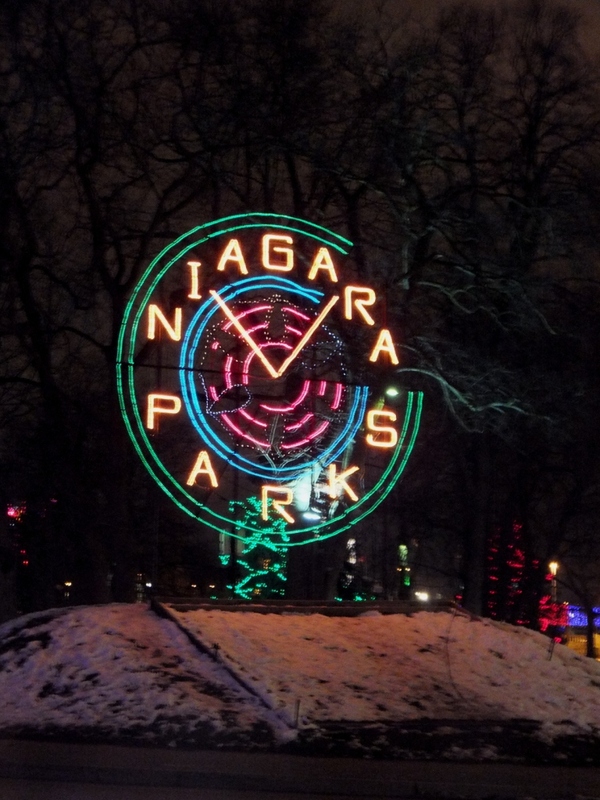 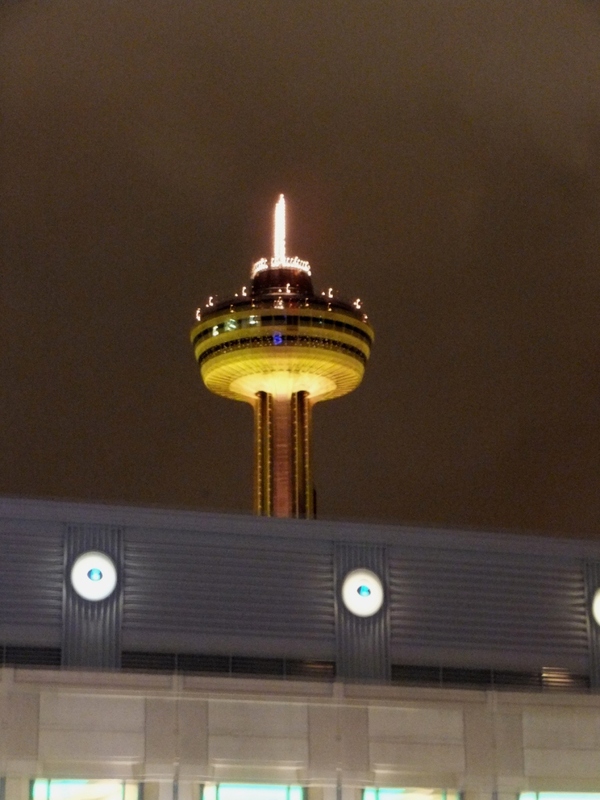 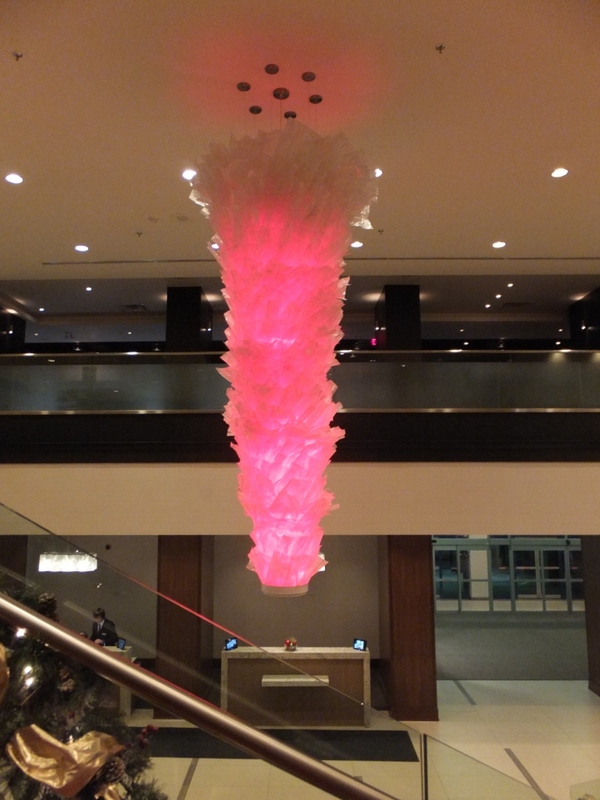 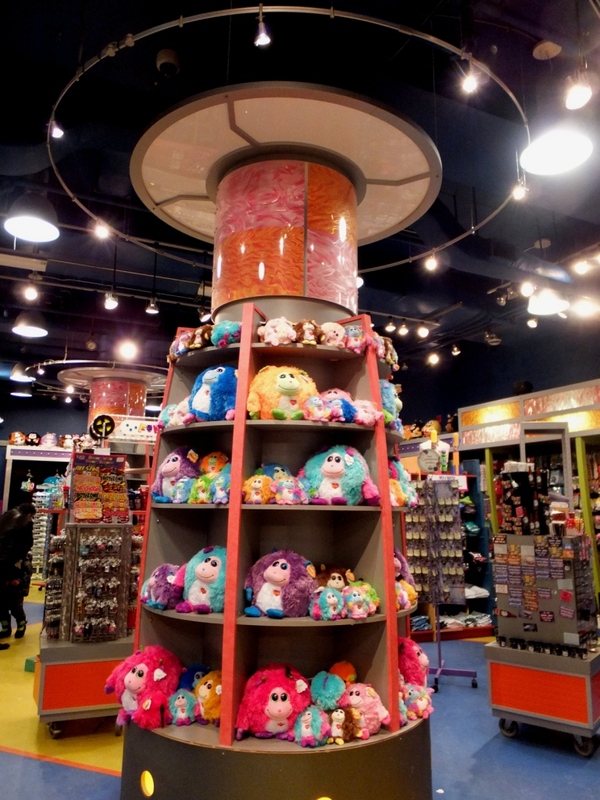 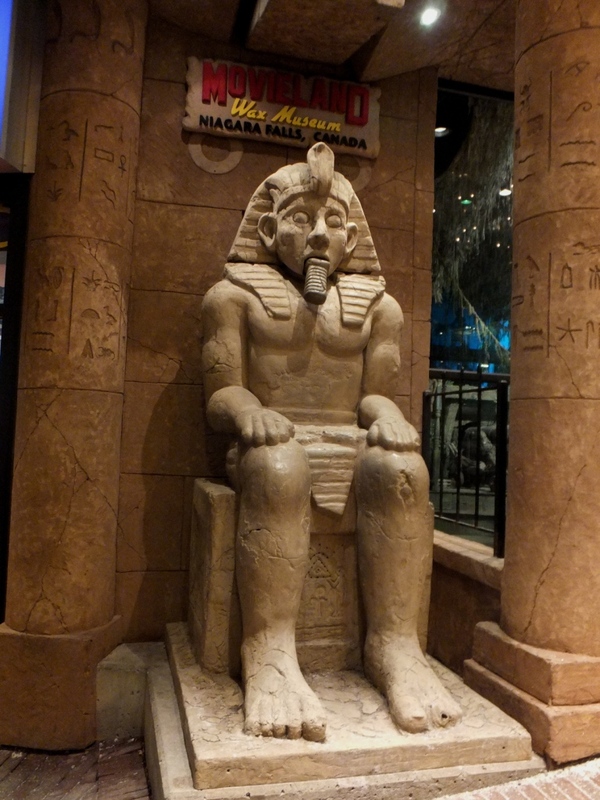 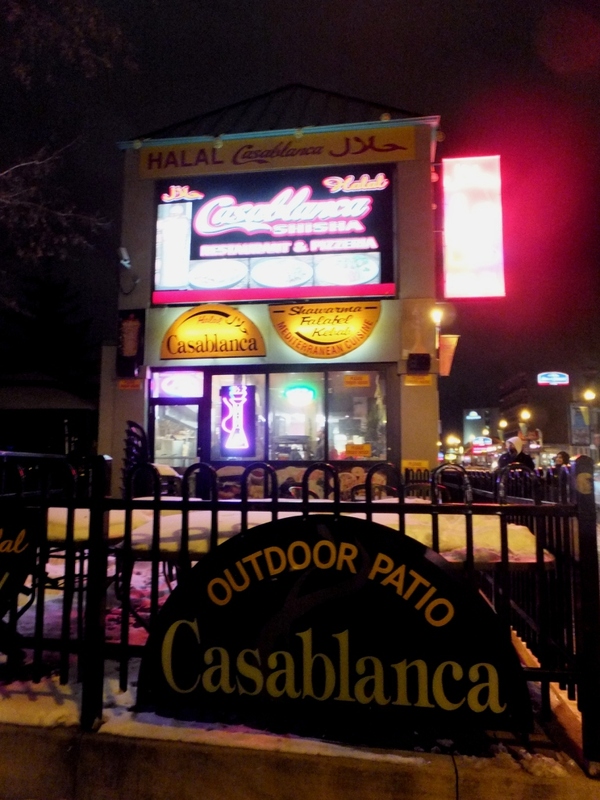 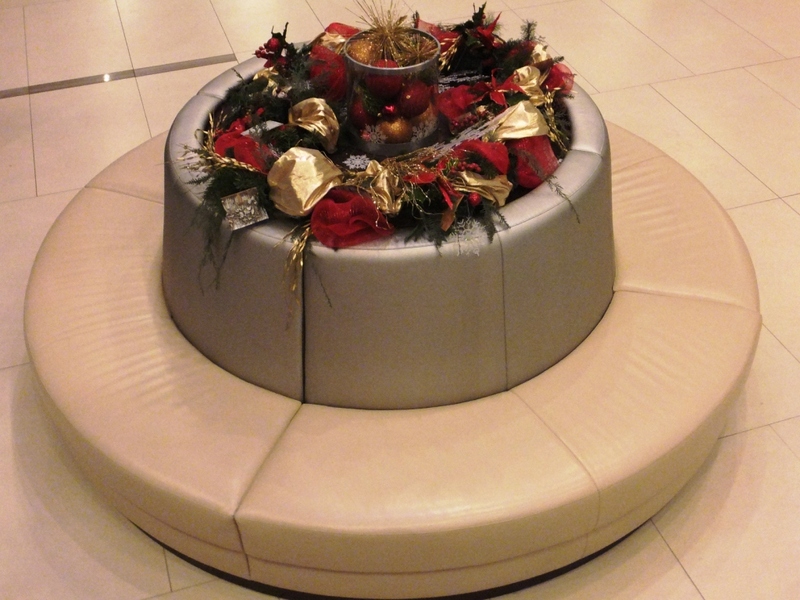 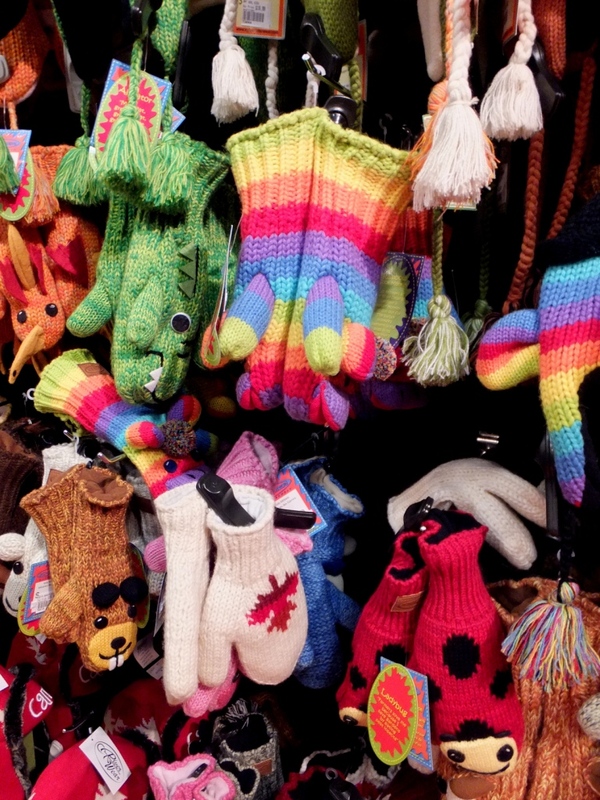 Niagara Falls, Ontario always has a few curiosities ready….